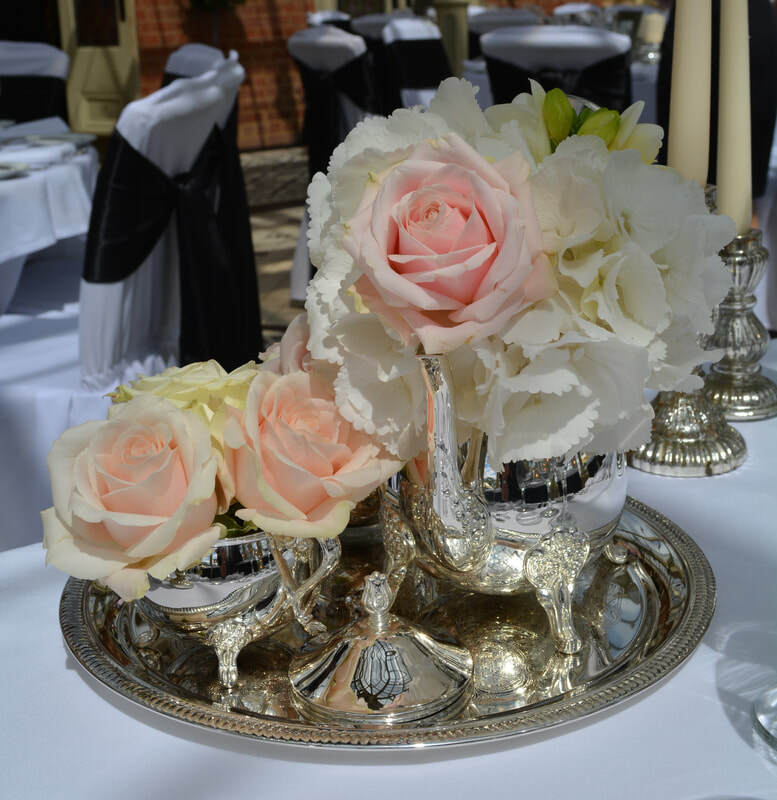 This was a big year for gold and rose gold but in this blog I wanted to pay homage to Silver. 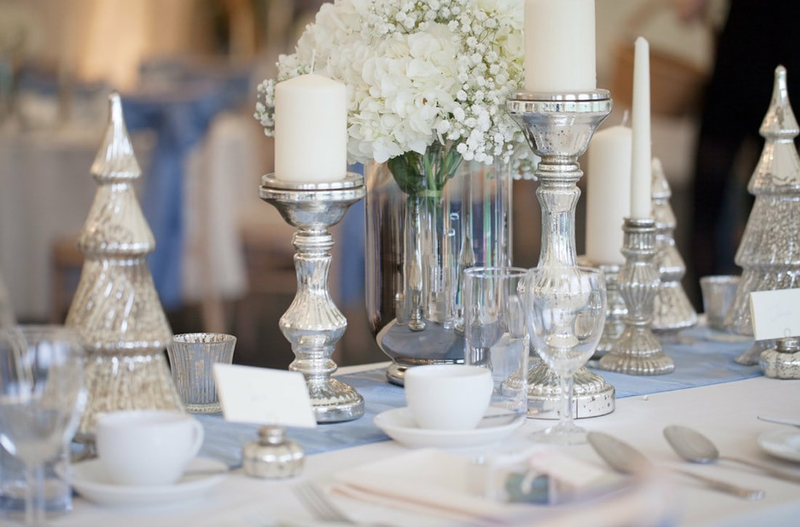 Mercury silver made a big impact in 2016 and its popularity was still strong over the last season. 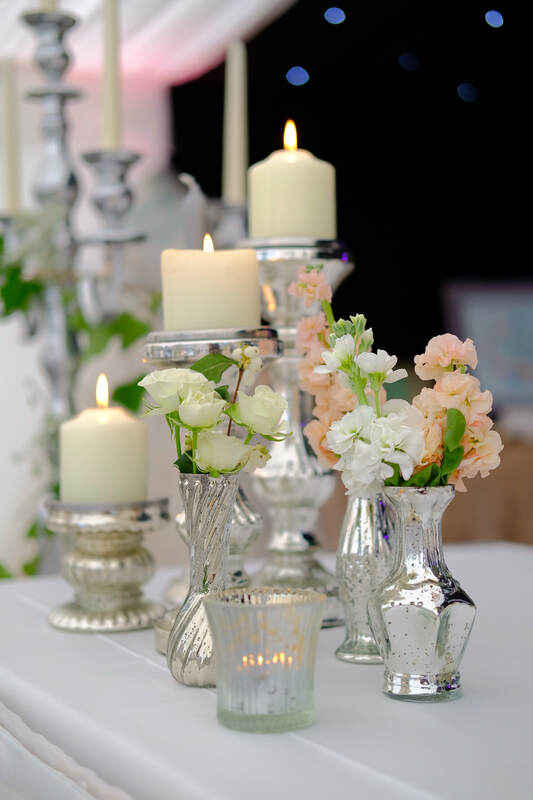 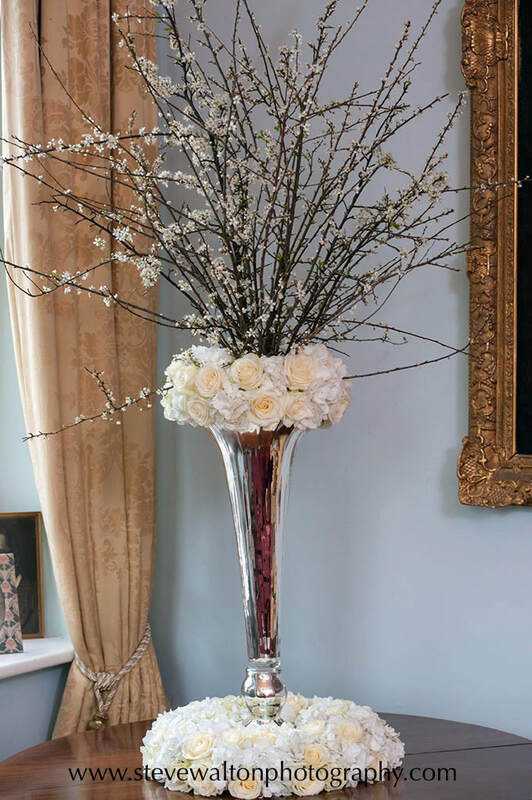 While some themes come and go, silver is a classic decoration and seems set to stay, which is just as well as we have an abundance of lovely silver and mercury in our stock! 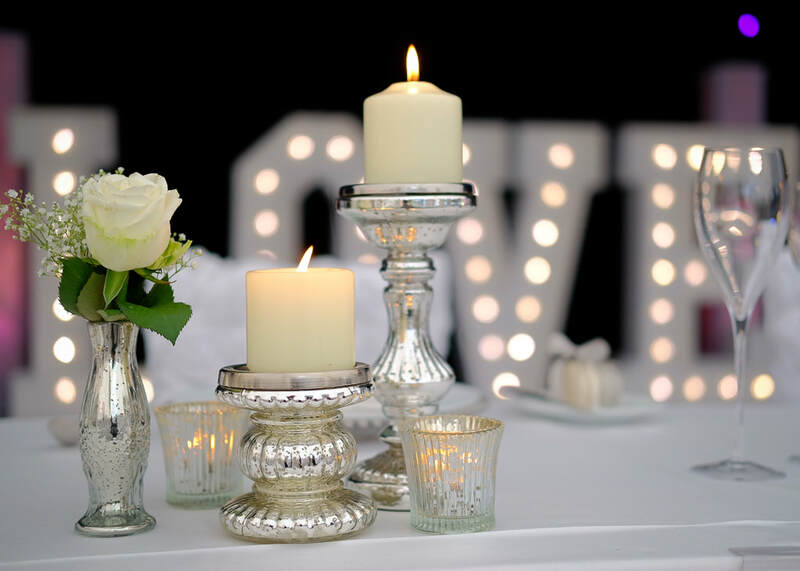 Below are some of the best pics from last season, I think you'll agree that if you are looking for a fresh, light decoration silver is a really good place to start. 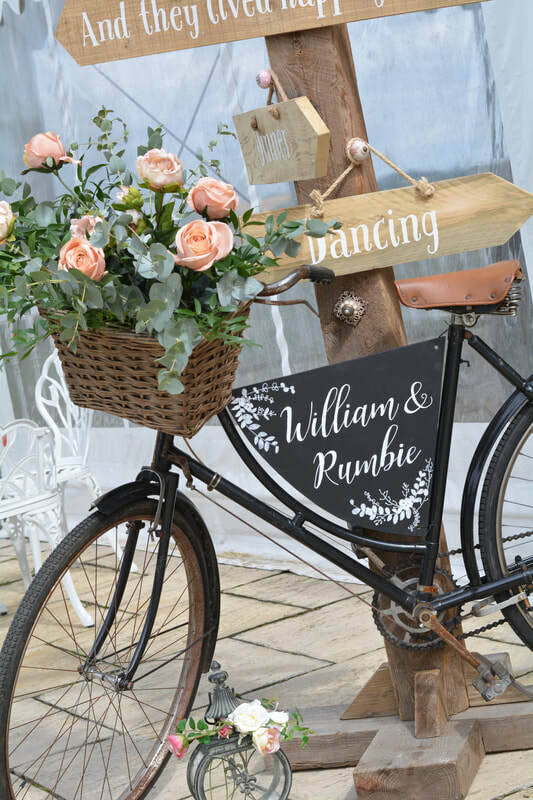 If you are interested in any of the items above get in touch for a chat. 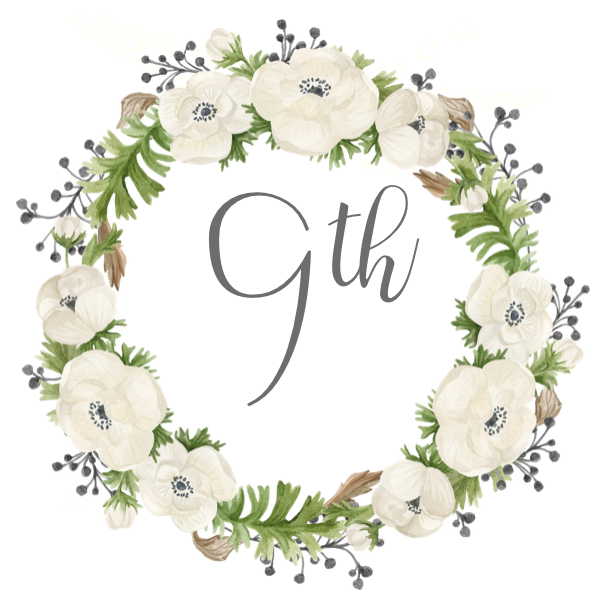 Below are some of the great things Julia has done. 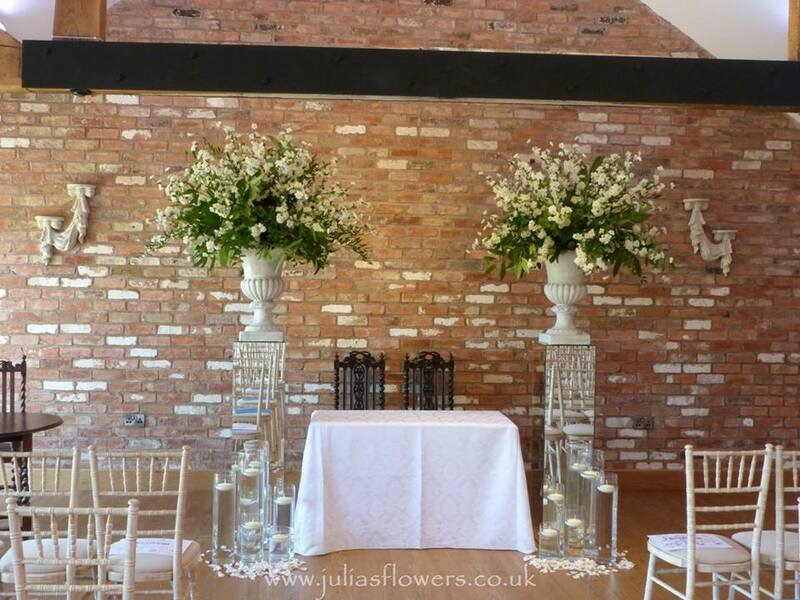 if you are looking for a florist who is friendly and produces outstanding work give Julia a call for a chat. . 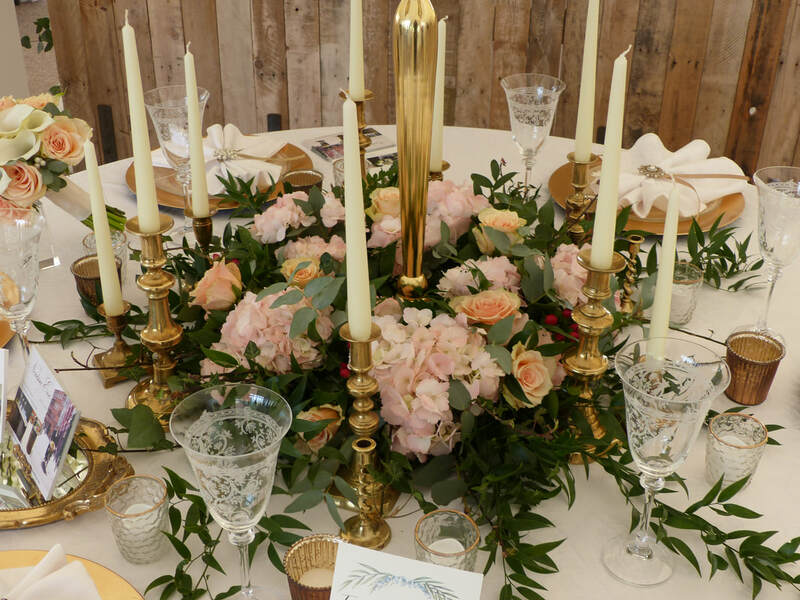 These are just a few of the weddings we've worked on together, head over to Julias website to have a look at some more or give her a call for a chat. 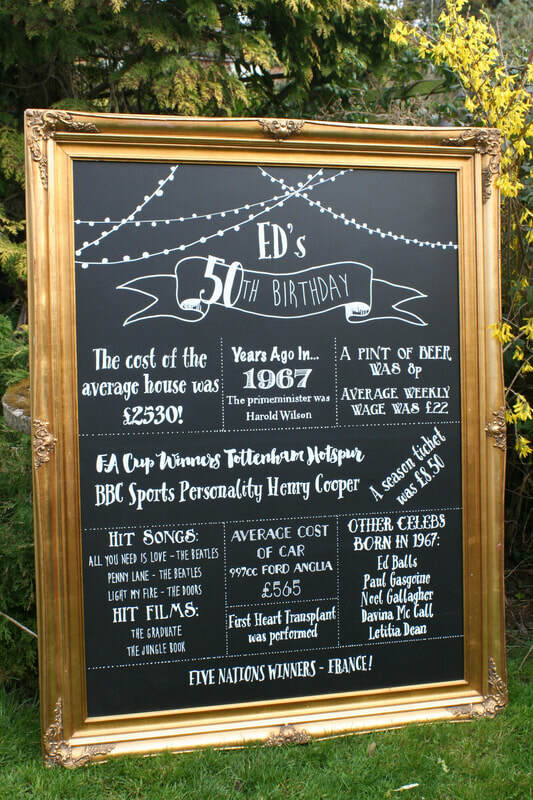 We started making bespoke chalk boards and handmade accessories fairly early on. 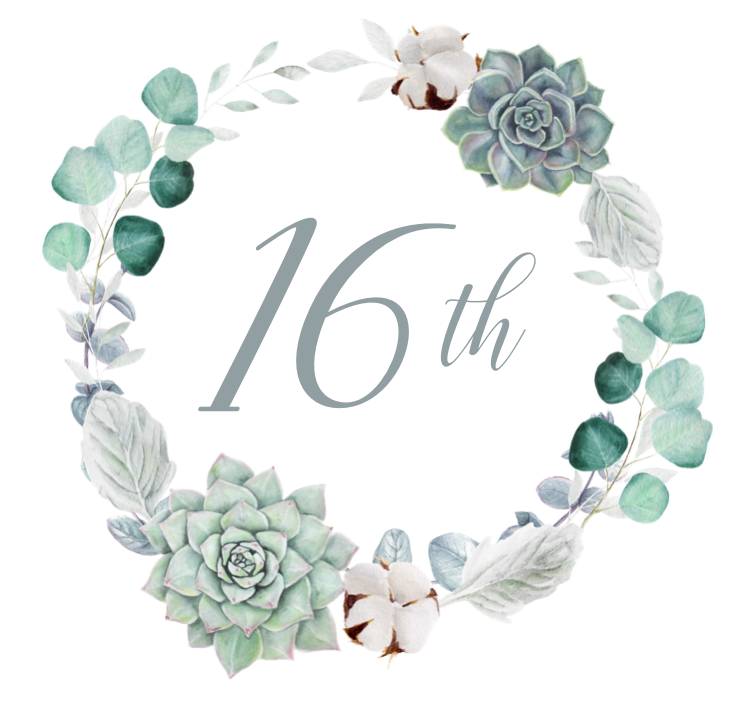 As an illustrator these items have always given me a much needed creative outlet. 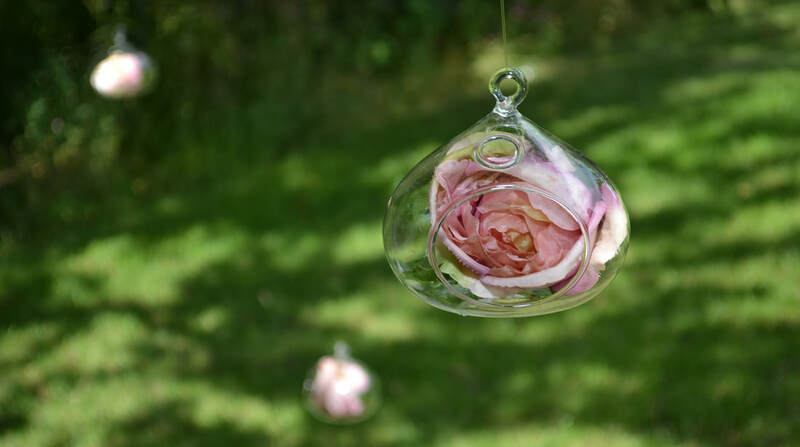 Following my Arts degree for too many years I put my passions on hold which has always left me feeling a little lost, if your from an Arts background you will understand exactly what I mean. 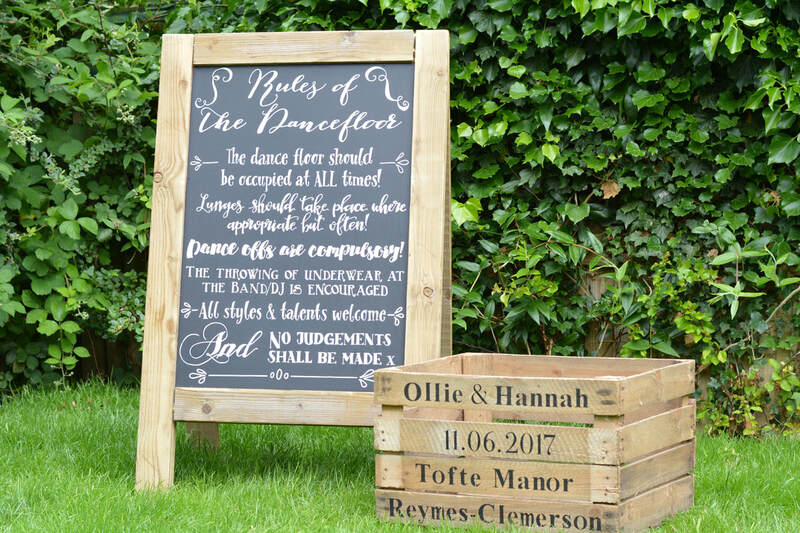 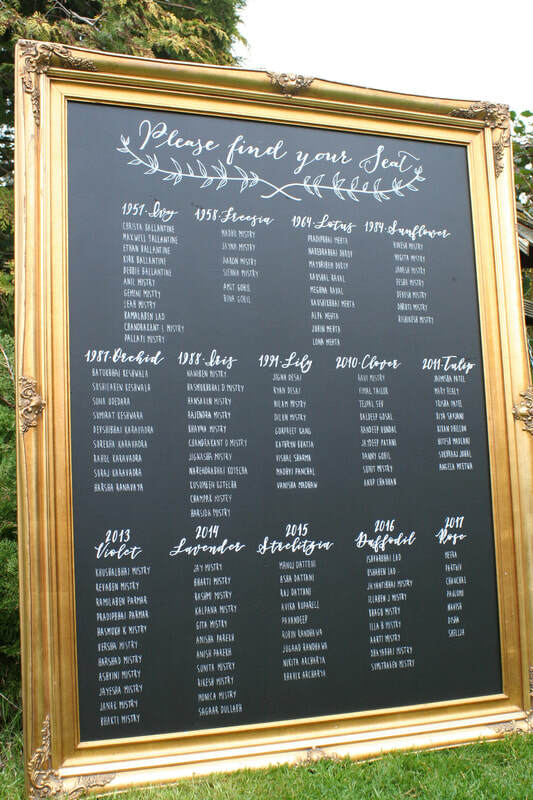 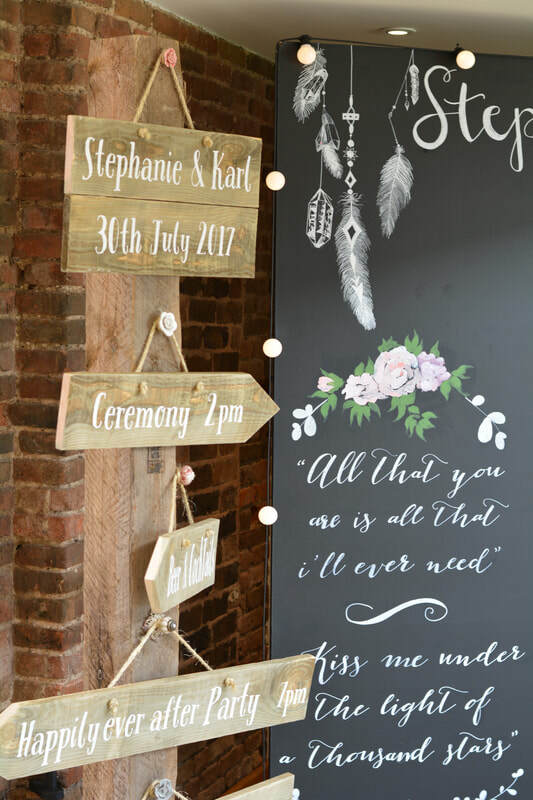 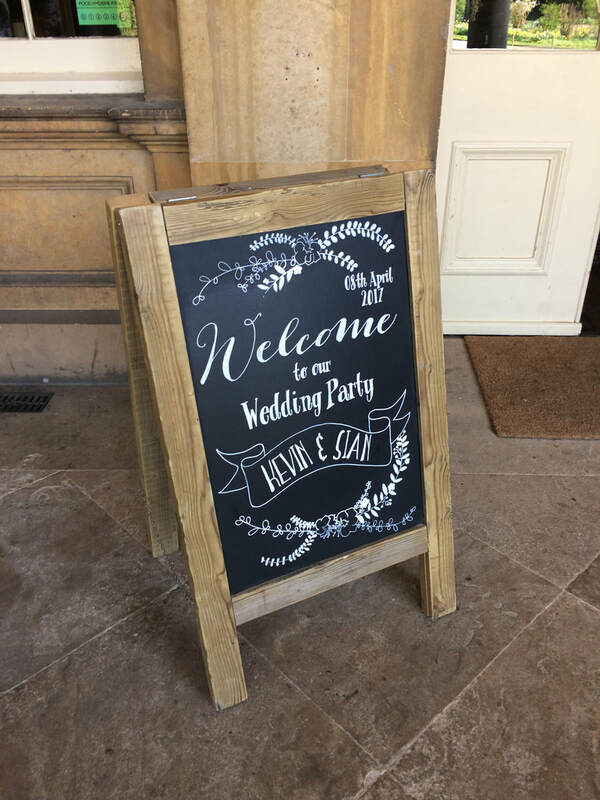 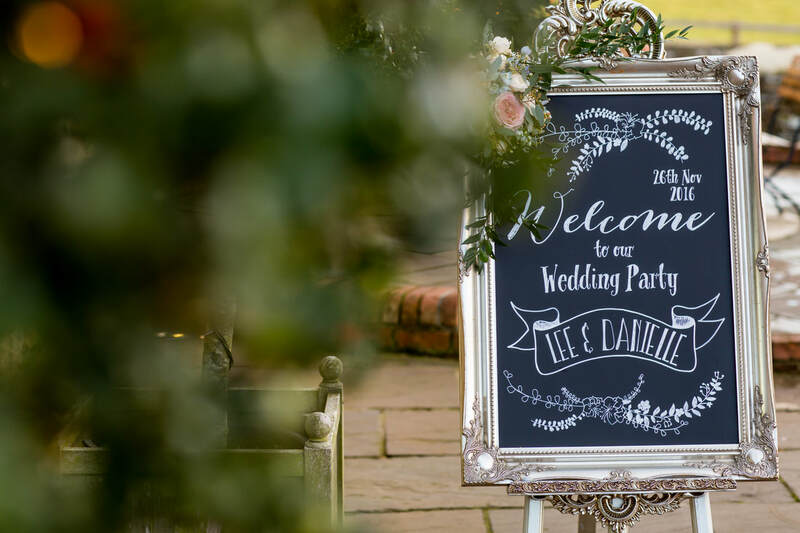 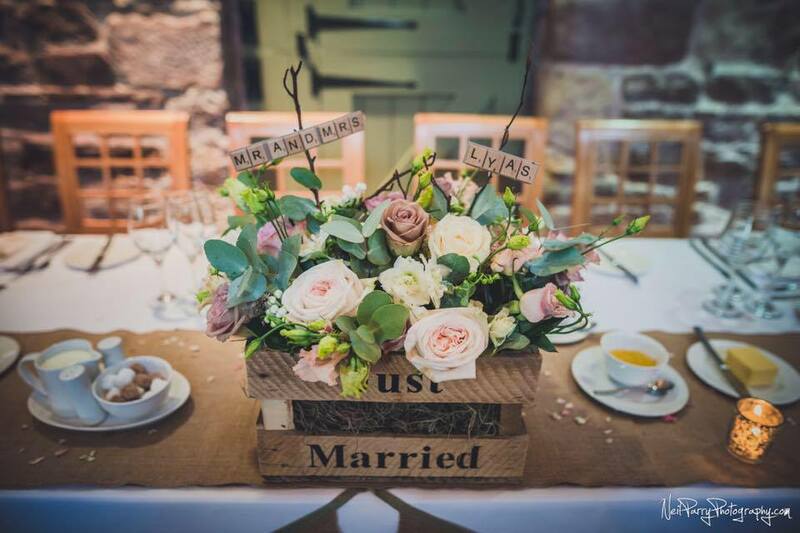 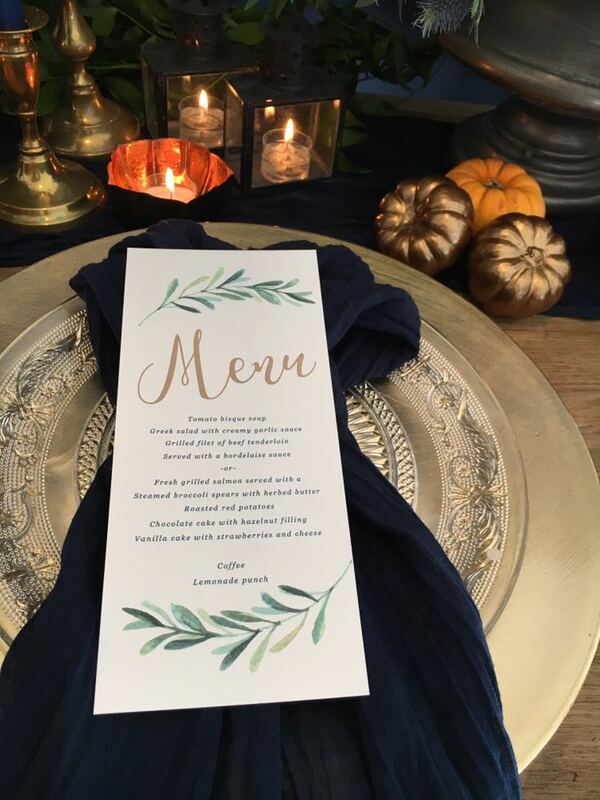 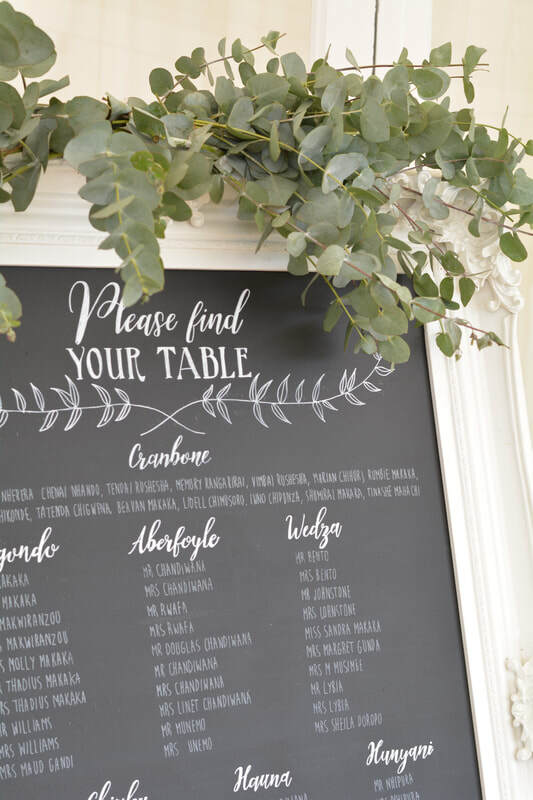 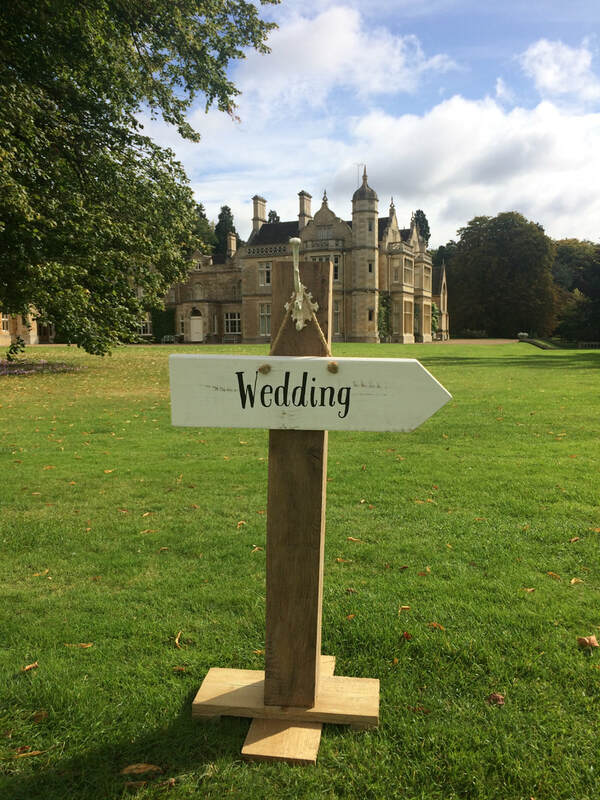 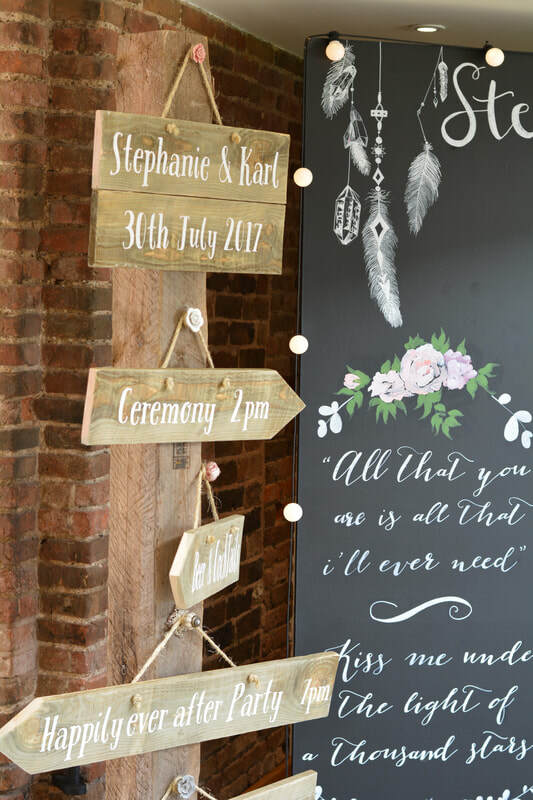 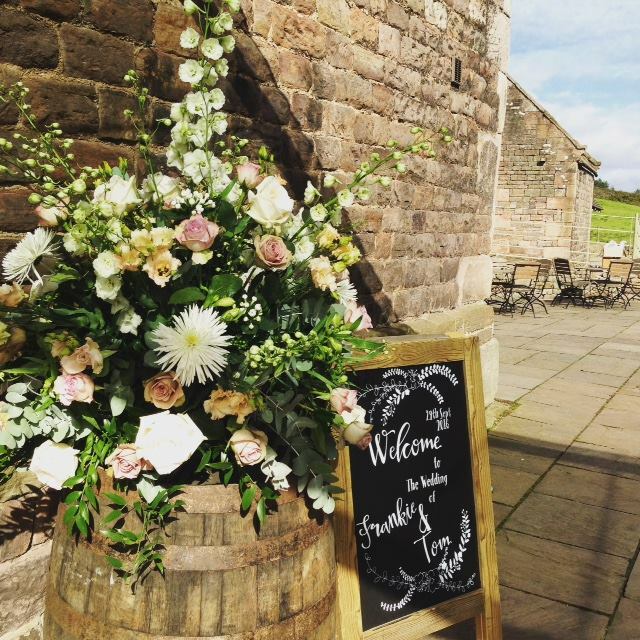 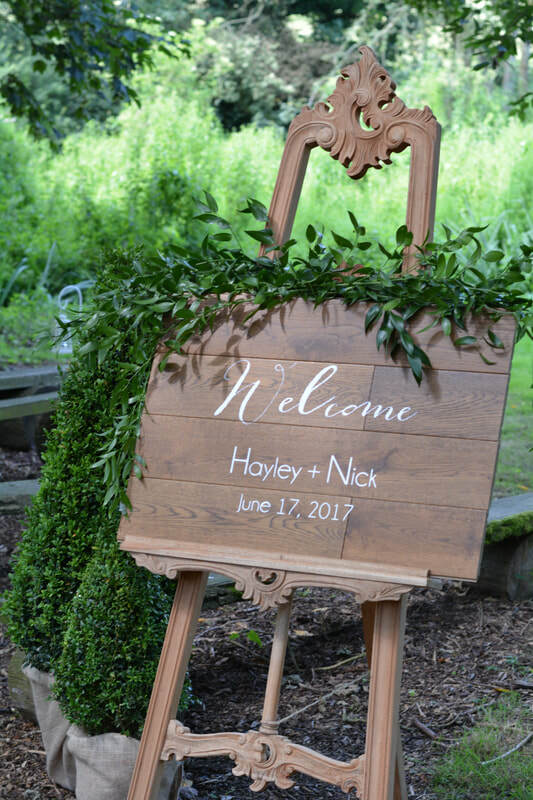 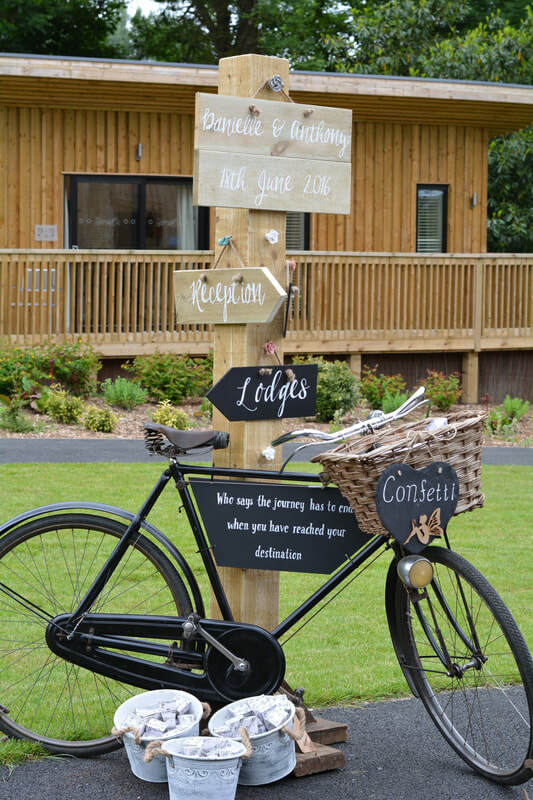 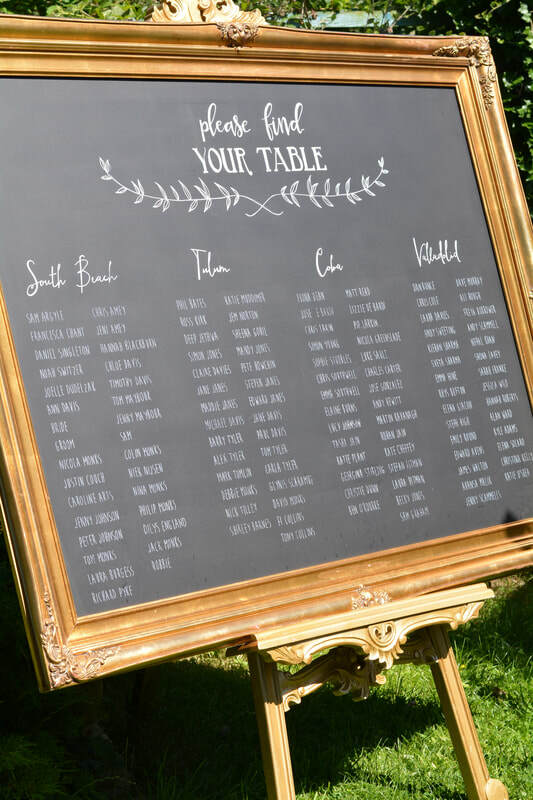 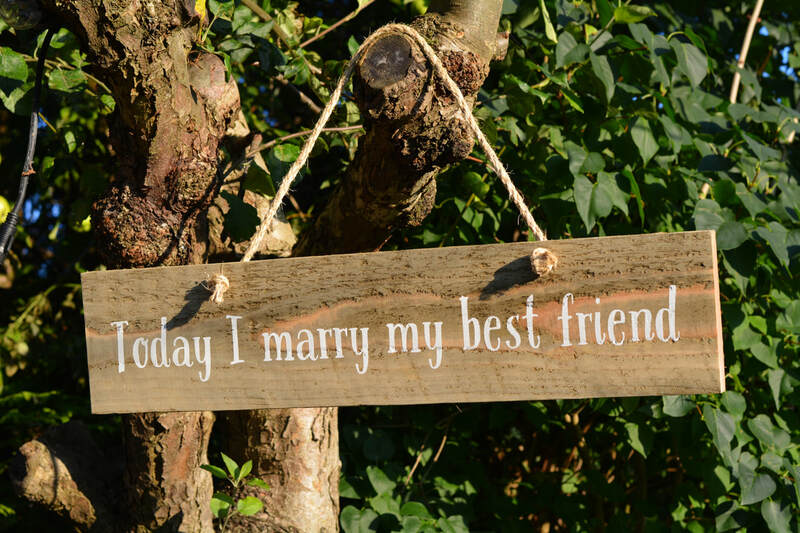 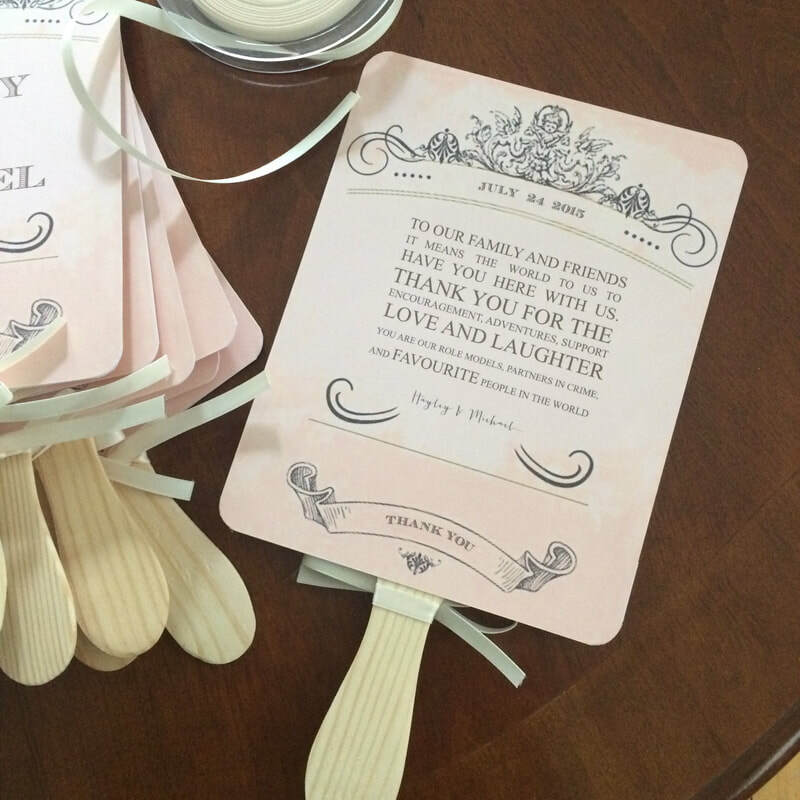 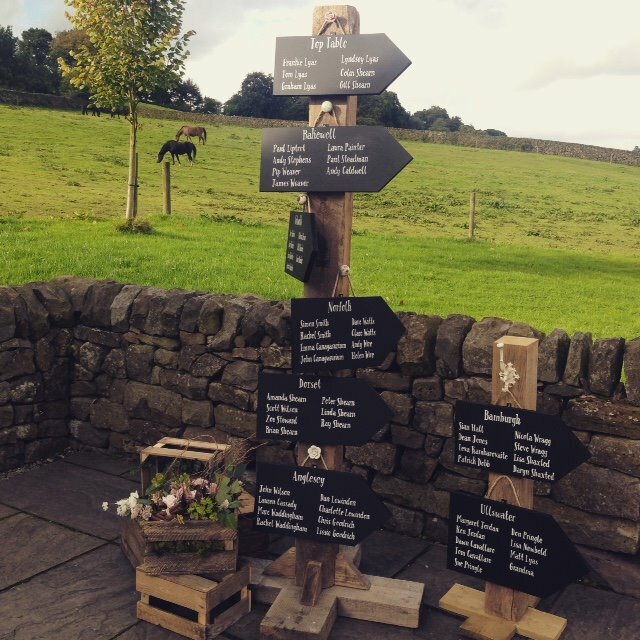 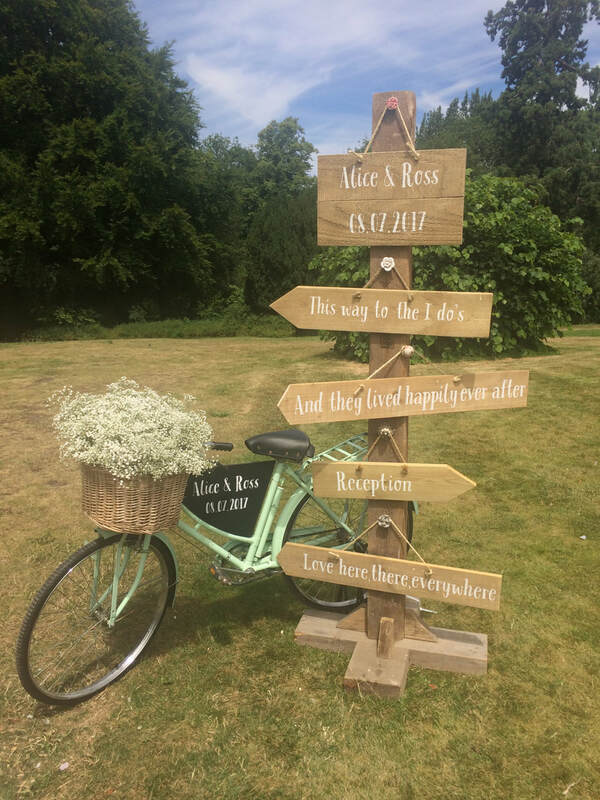 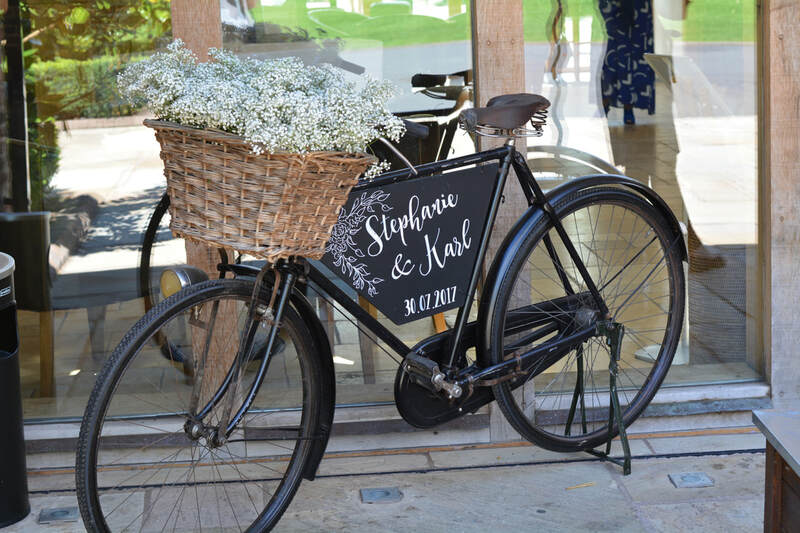 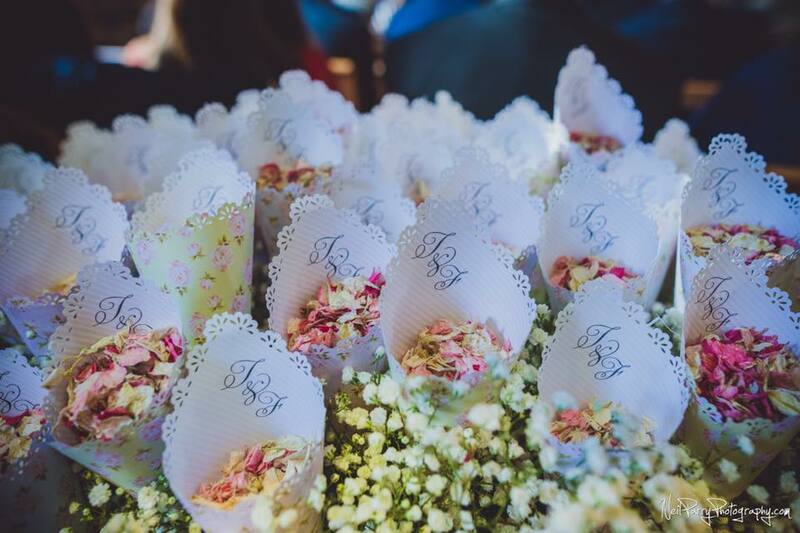 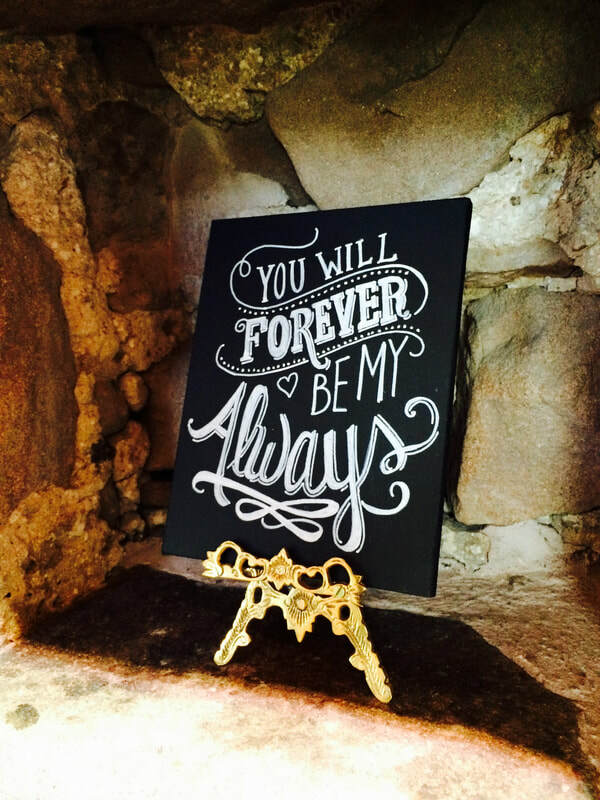 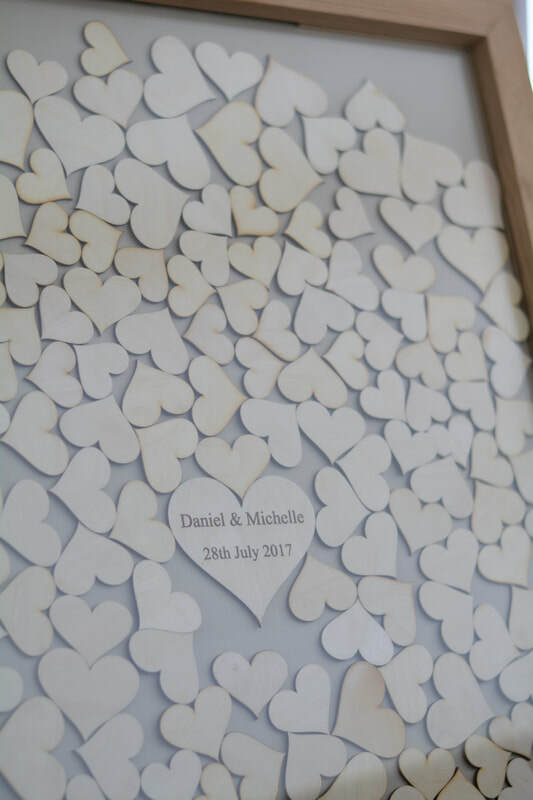 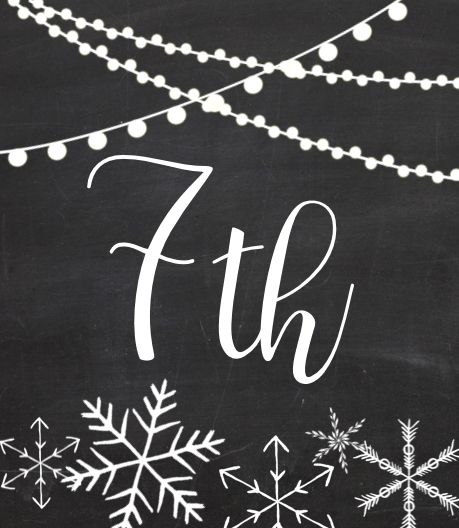 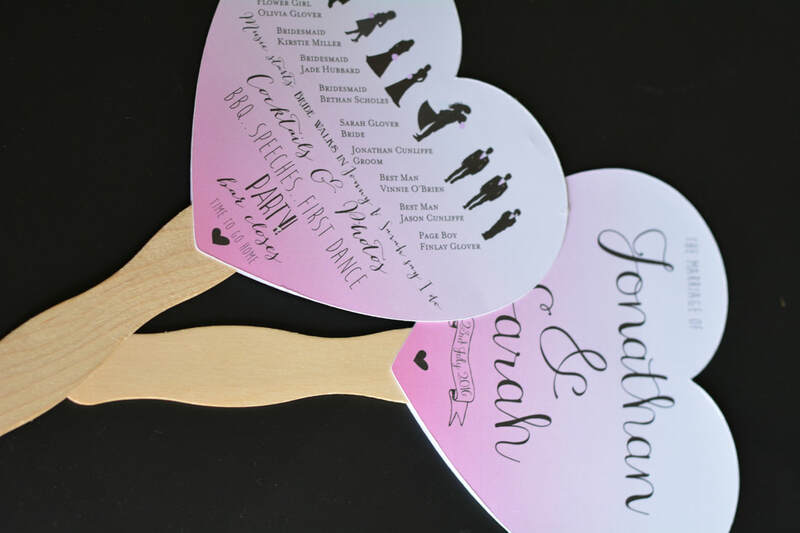 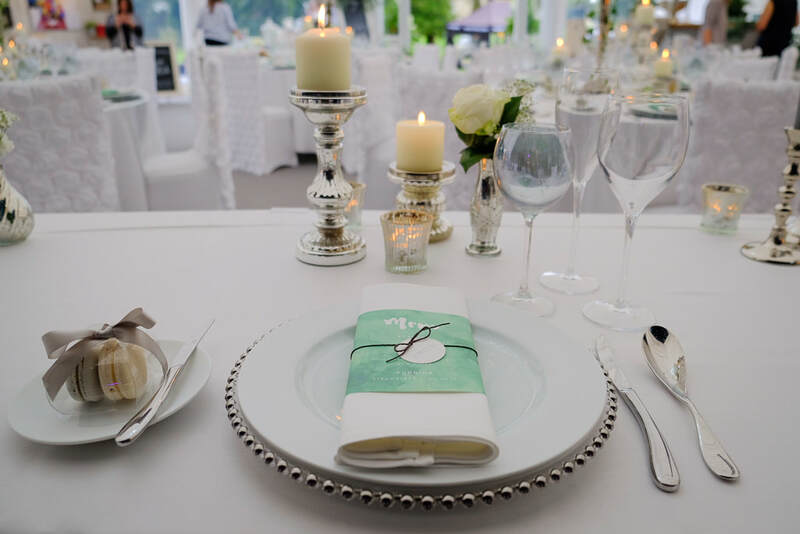 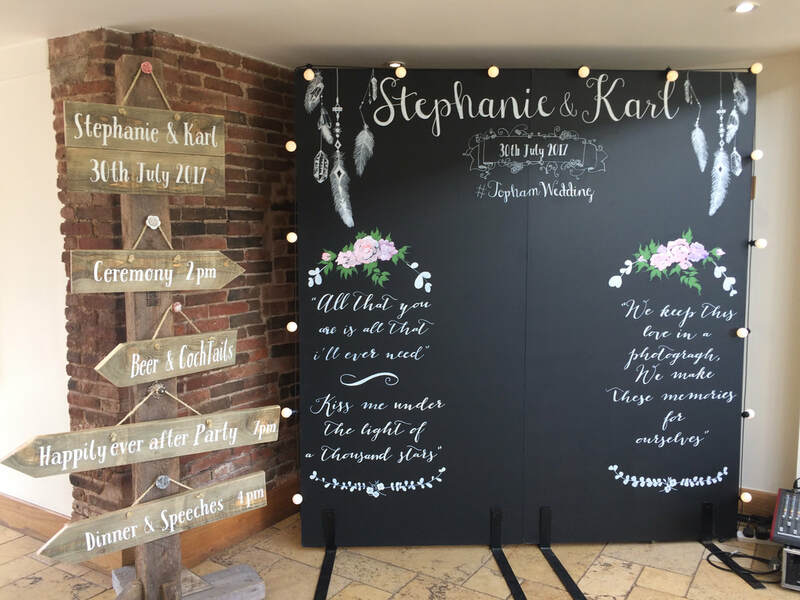 Within the first year of Nerissa Eve Weddings I realised there was a huge need for wedding signage, chalk board art and handmade items within the wedding industry, in fact roughly 90% of all of our weddings order something creative in one form or another. 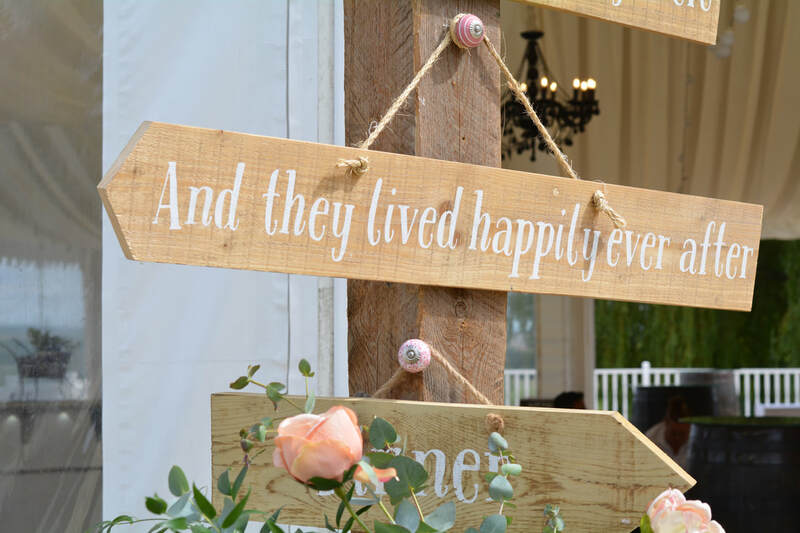 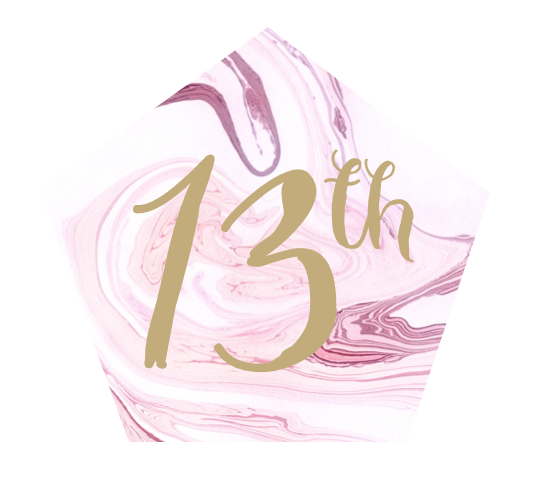 I love watching the plans unfold, the opportunities to style weddings and our lovely handmade products being a part of someones big day. 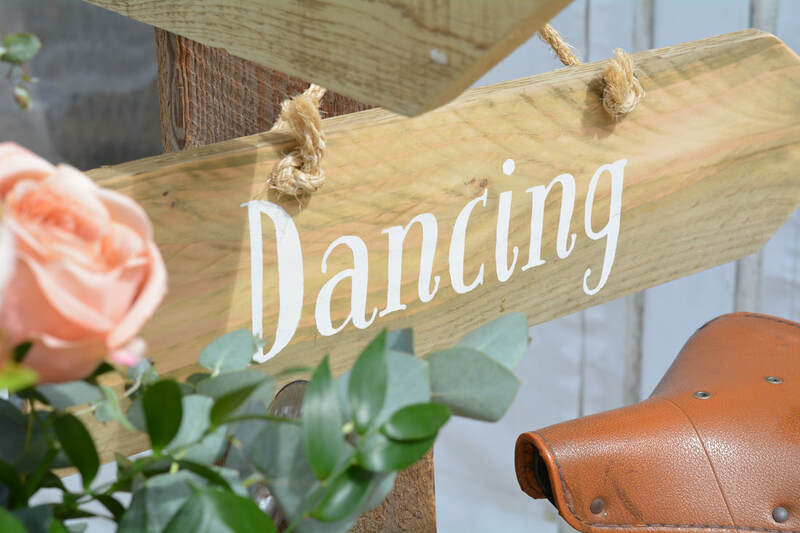 ​Below are some of the handmade products that turn our office into a hive of creativity during the mad season, and we just love it!! 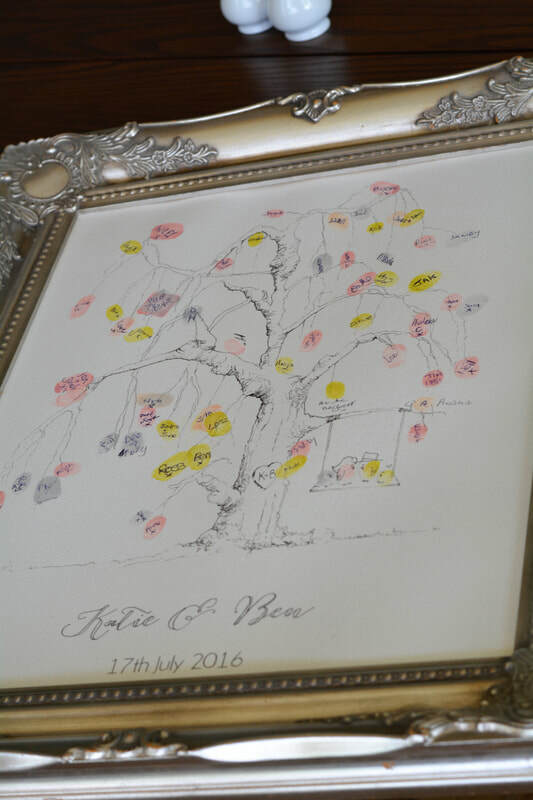 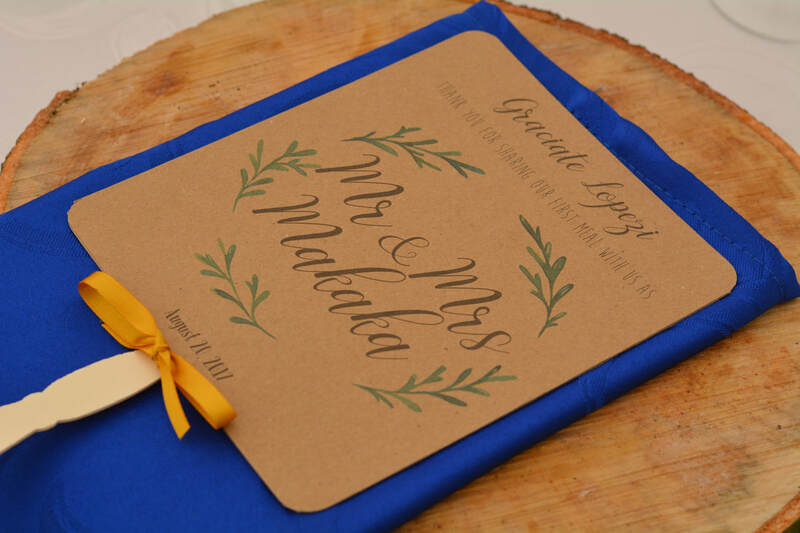 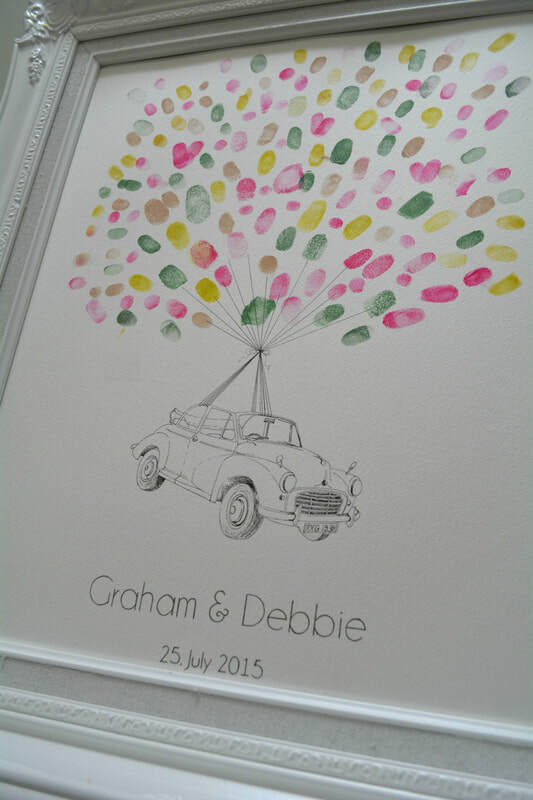 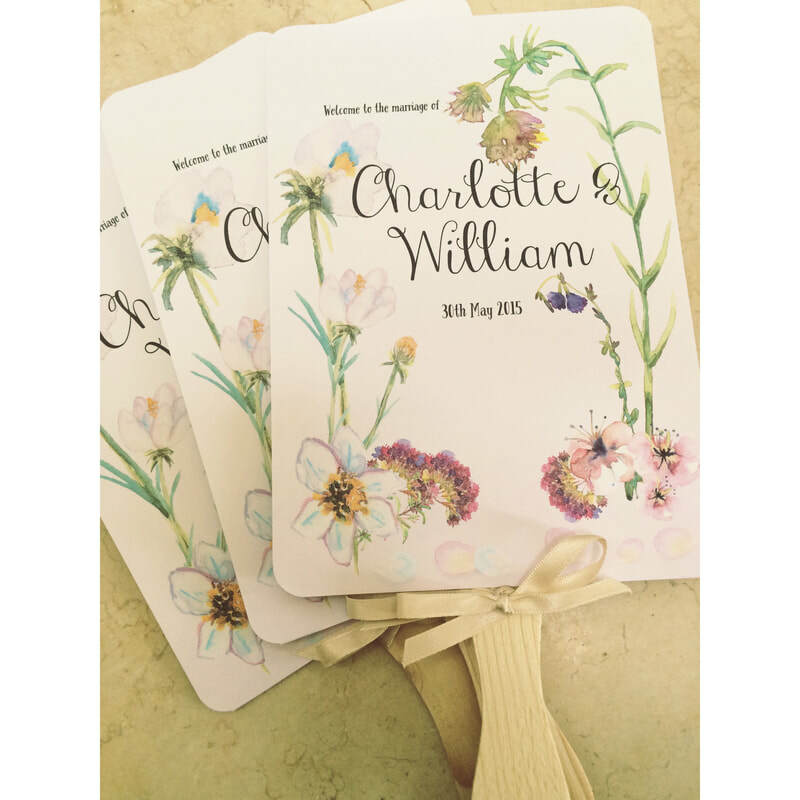 Fingerprint guestbooks are particularly popular and something we love to create. 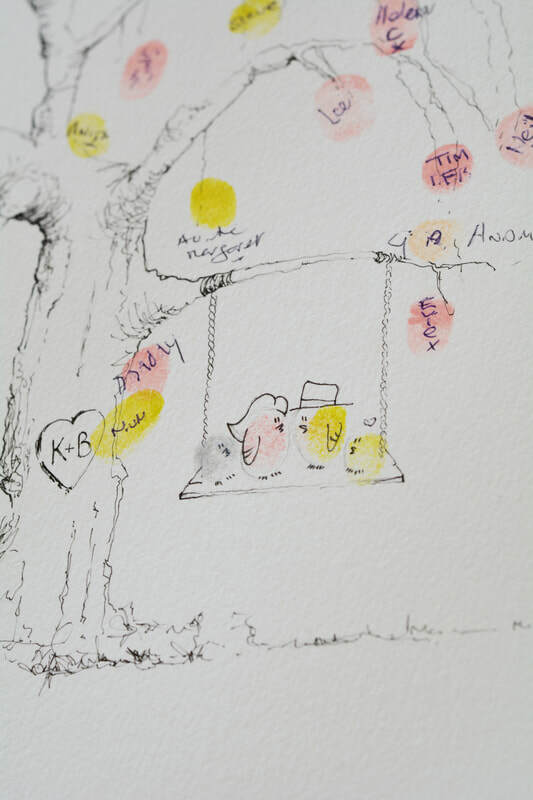 The more personal the drawing the better! 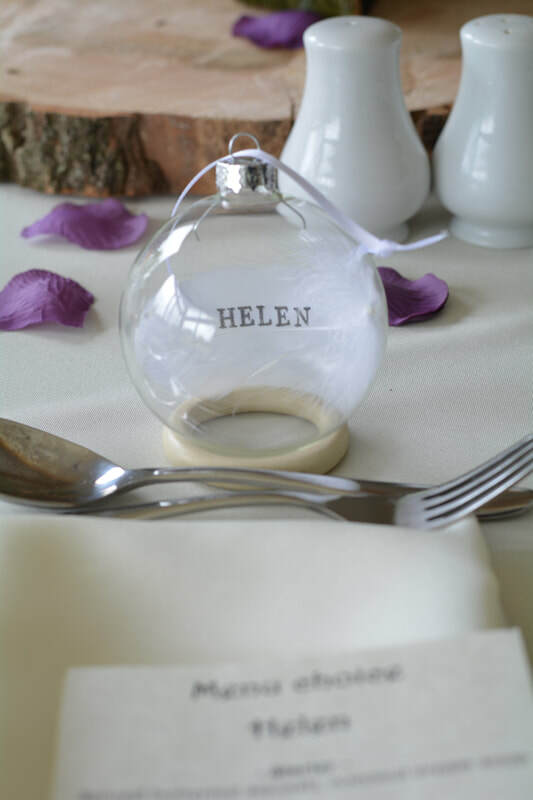 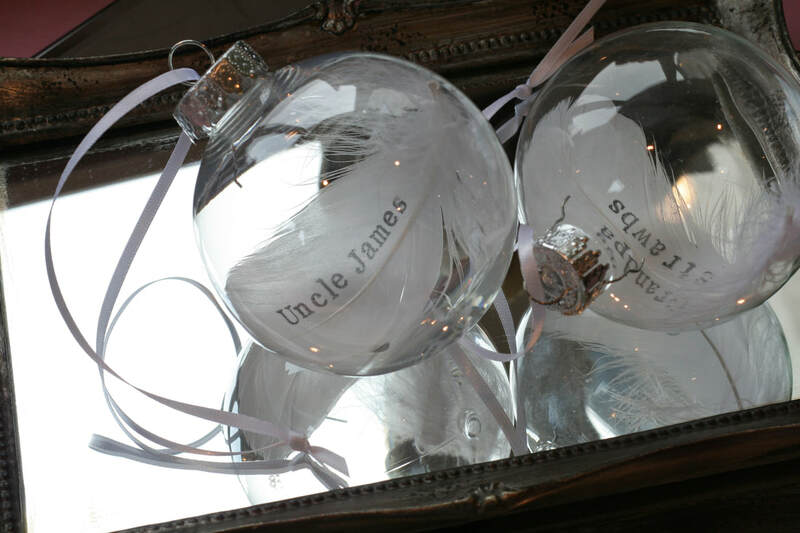 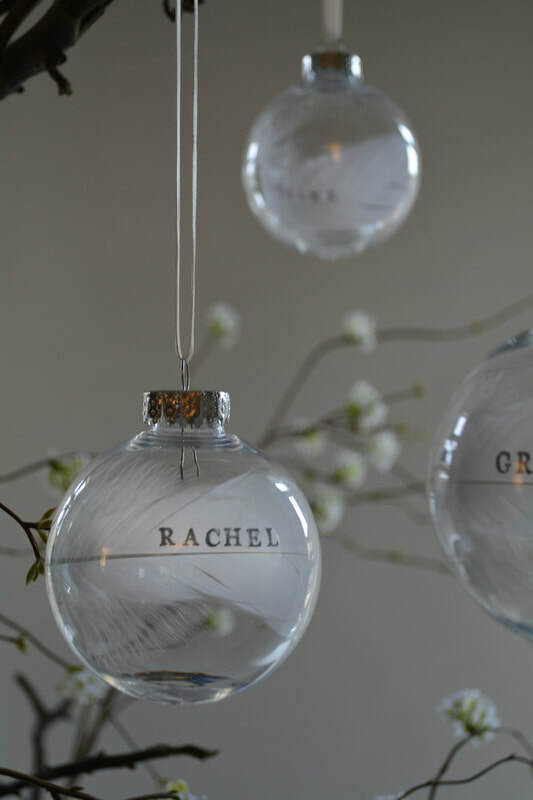 Glass baubles with a personalised feather inside make original favours and lovely keepsakes. 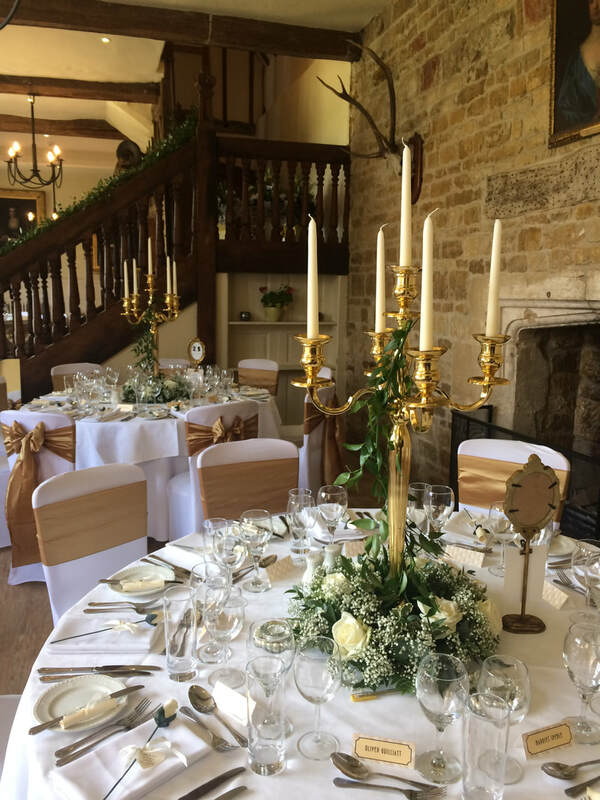 This large wedding is possibly one of my favourites for two reasons, the fabulous bride & groom, well their entire family really and the venue Keythorpe Manor (we love any opportunity to work at Keythorpe Manor). 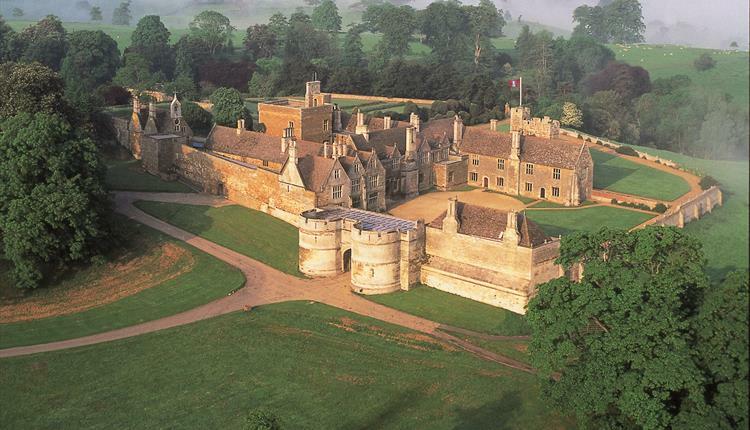 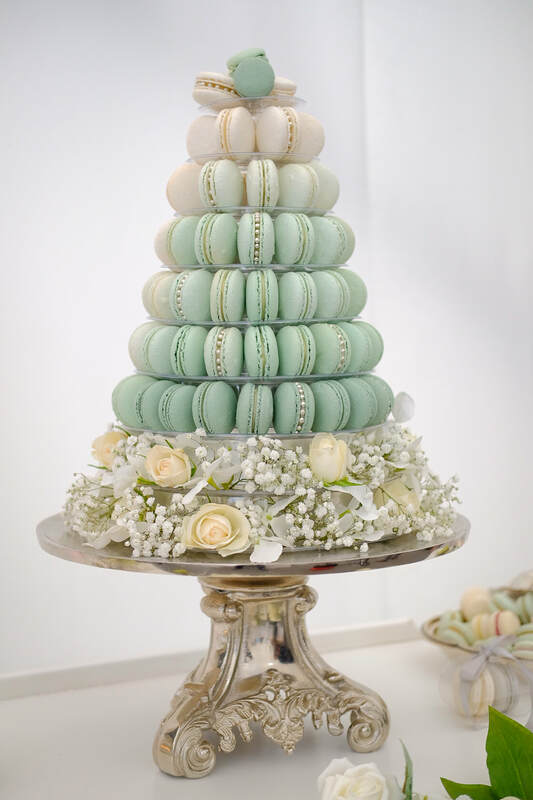 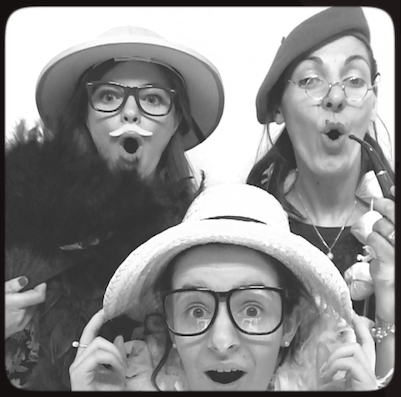 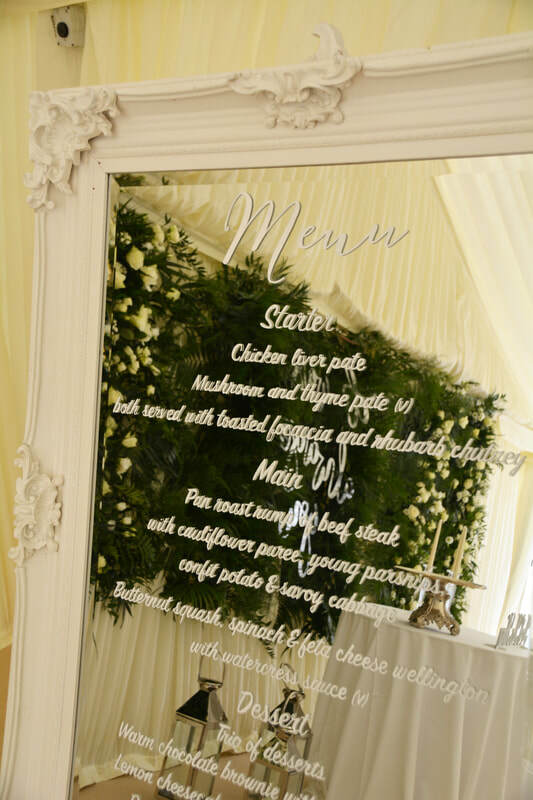 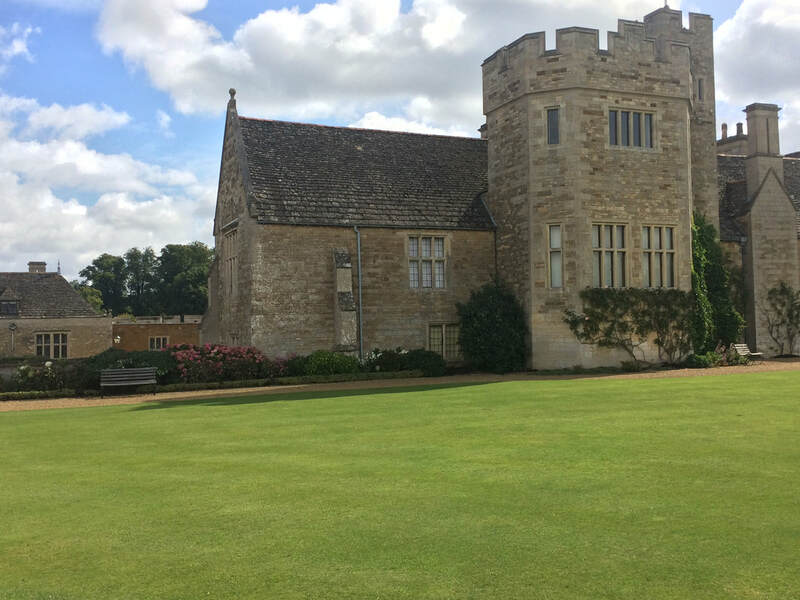 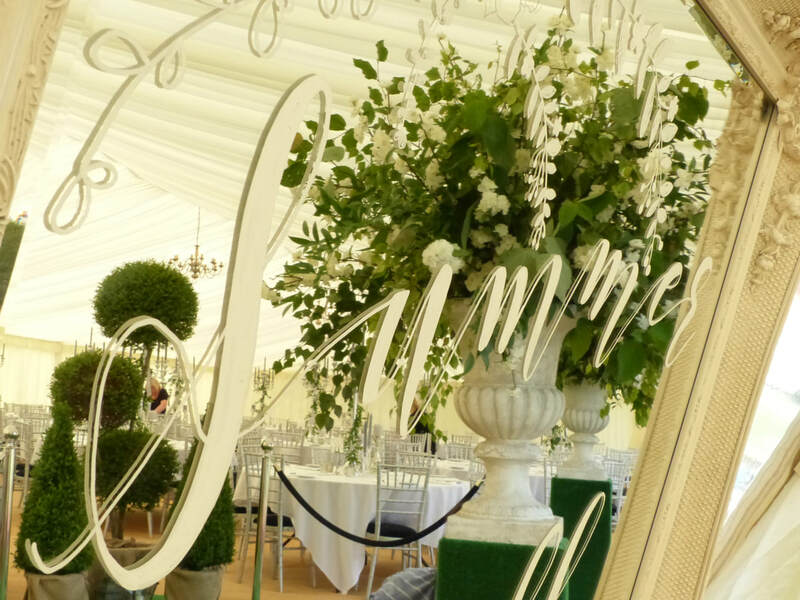 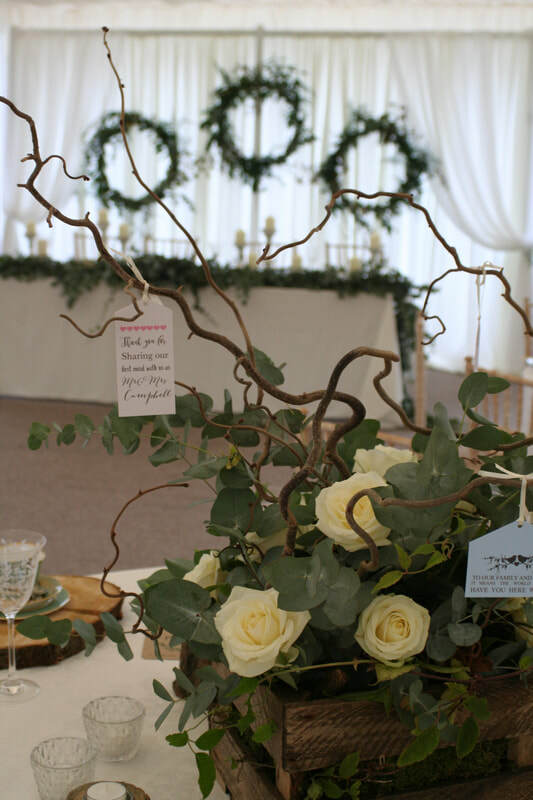 We first met Rumbie (bride) at a Keythorpe Manor wedding fair and hit it off straight away. 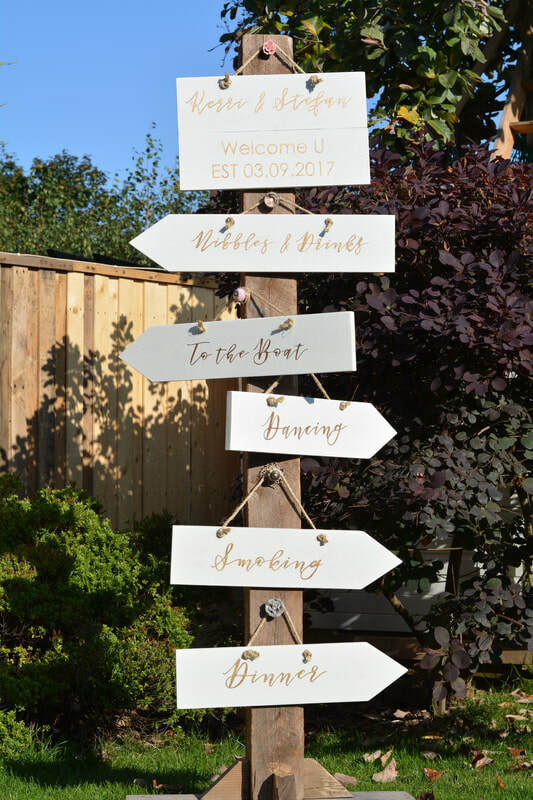 The family then came to visit us and view the items and I have to say I thoroughly enjoyed every aspect of this wedding, the build up, the emails, the conversations and meetings and of course the final day. 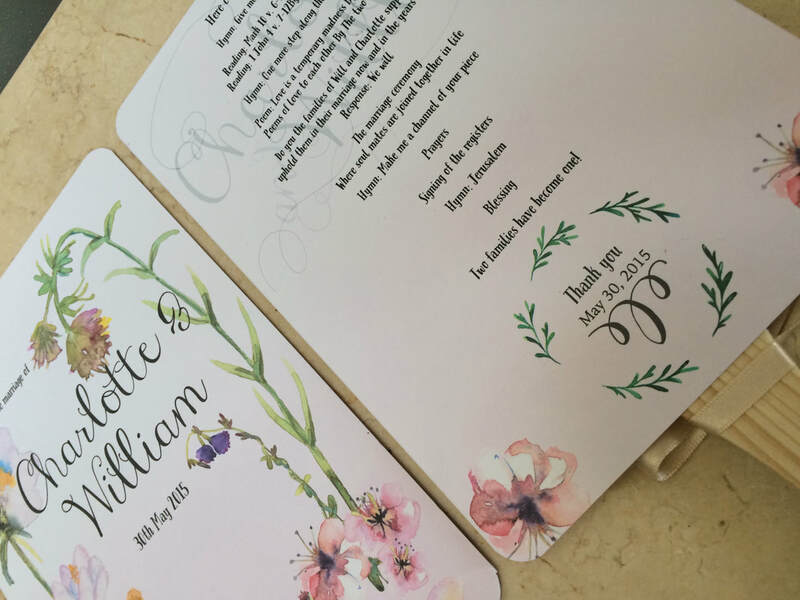 From start to finish it was an experience I will always remember. 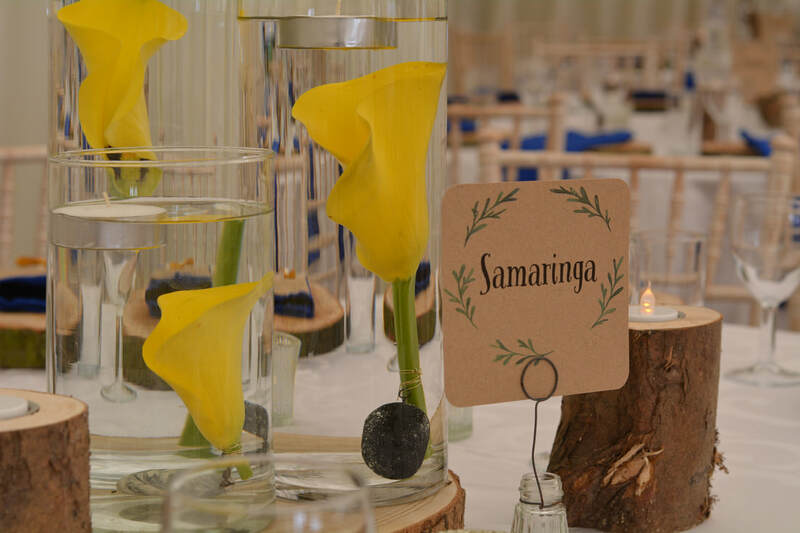 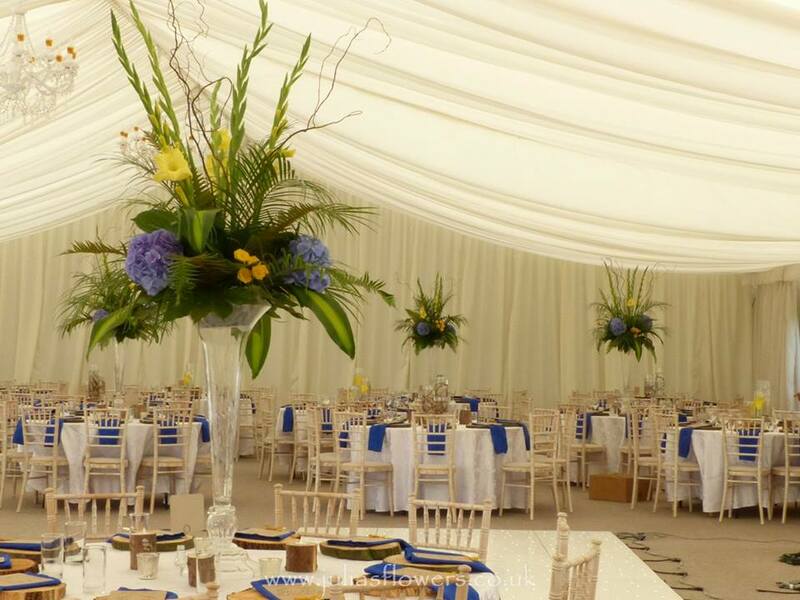 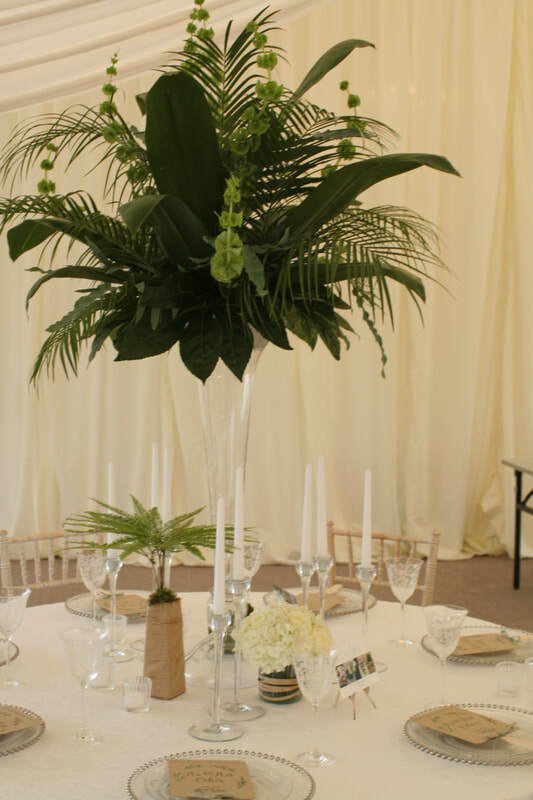 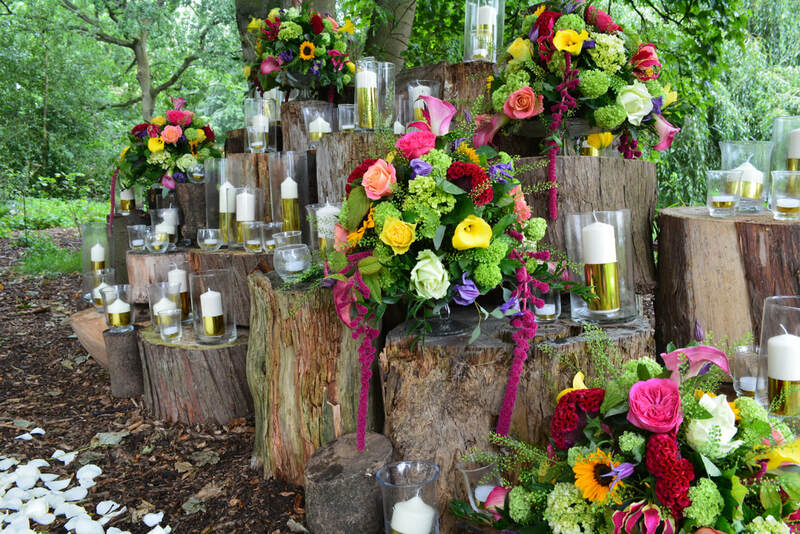 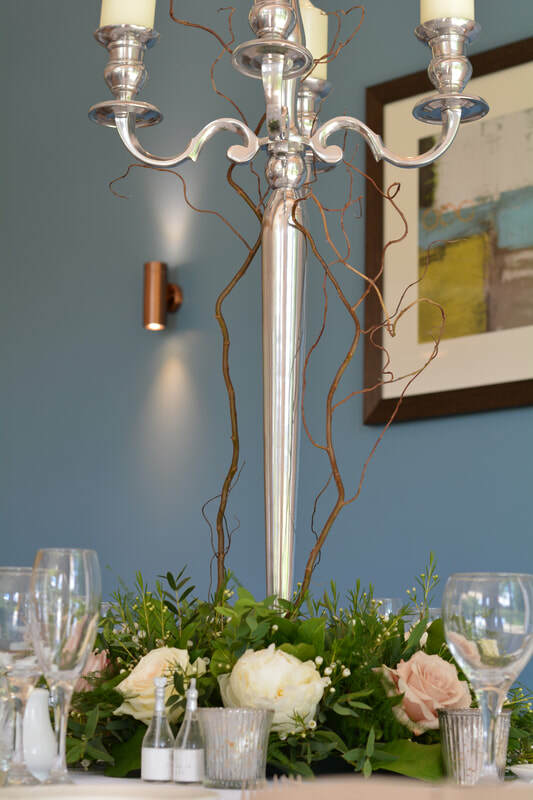 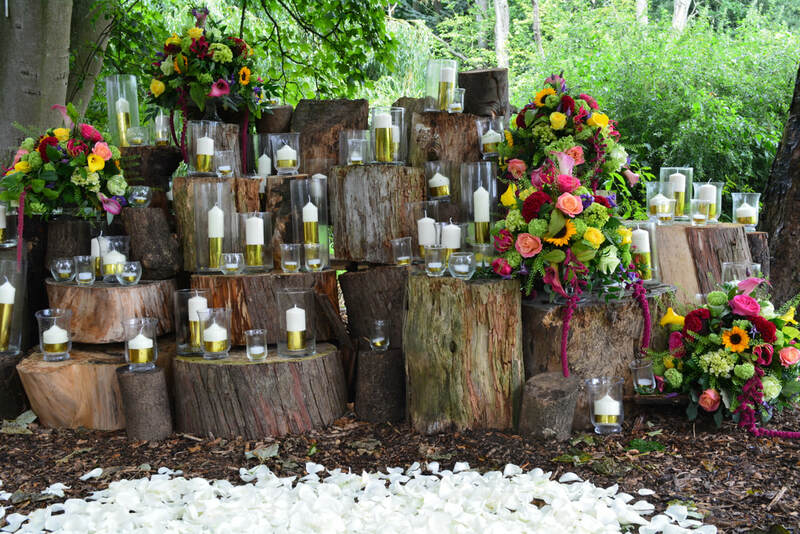 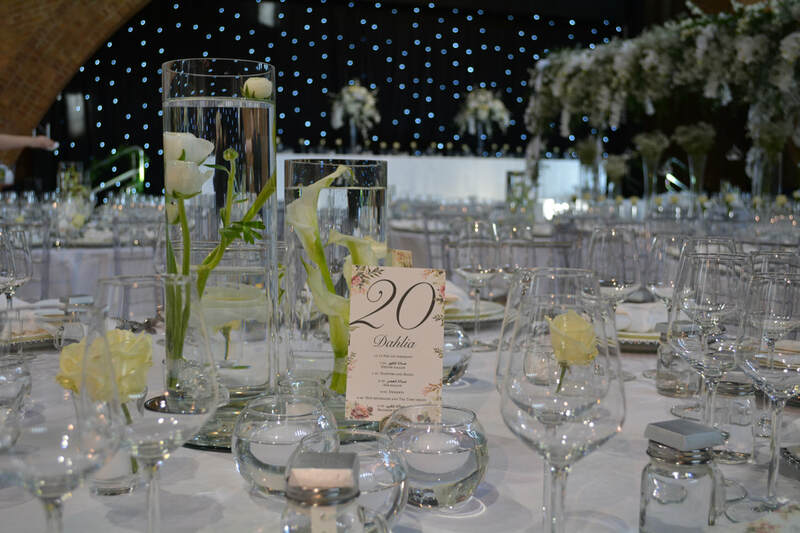 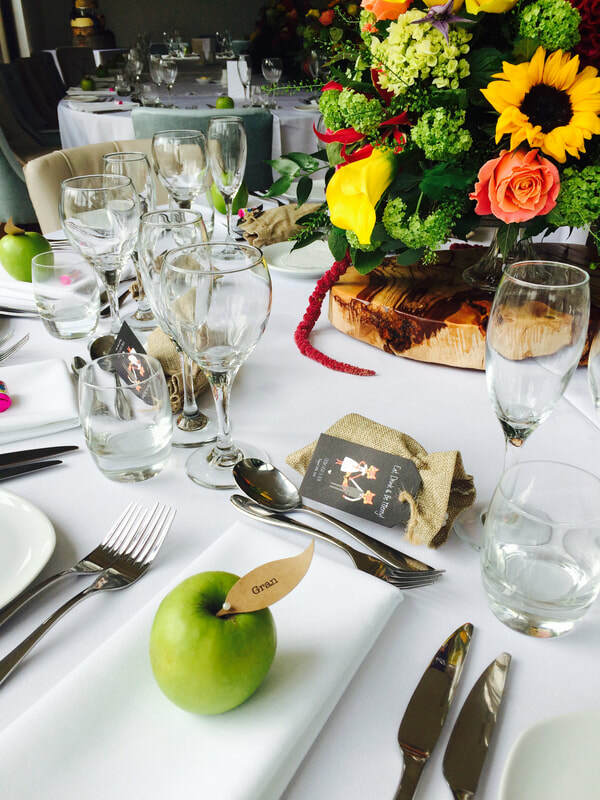 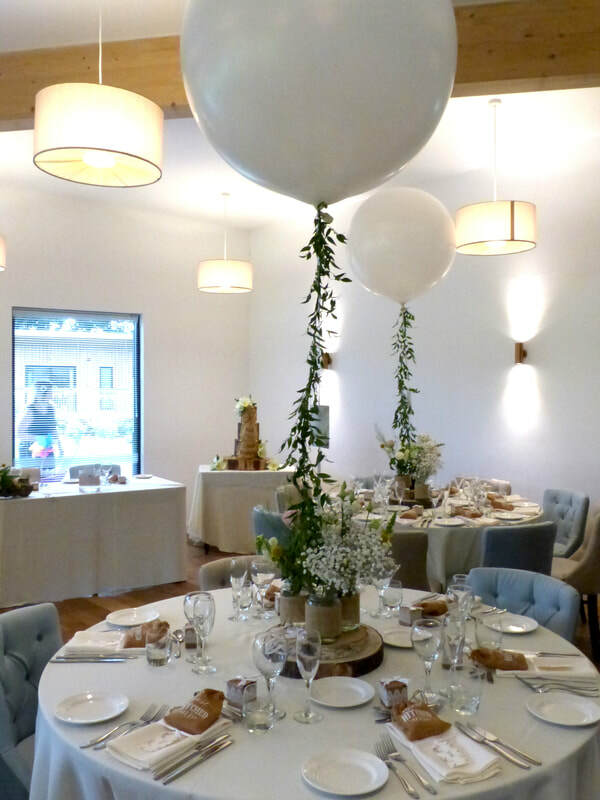 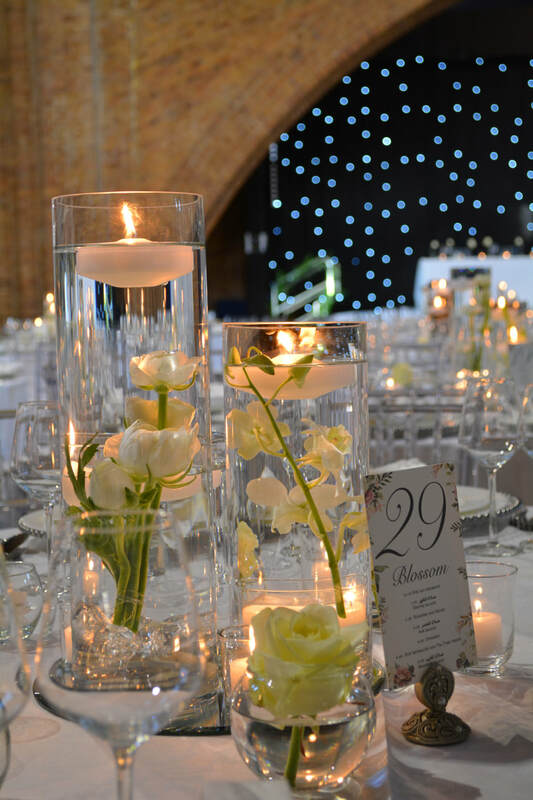 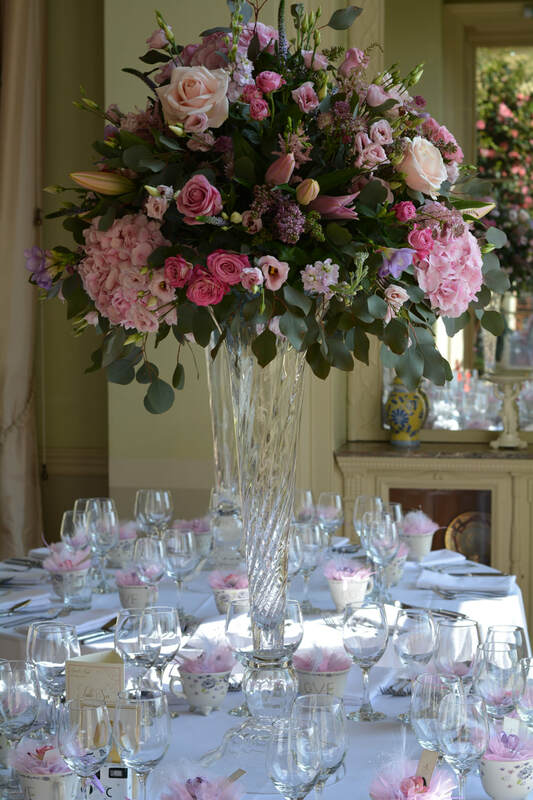 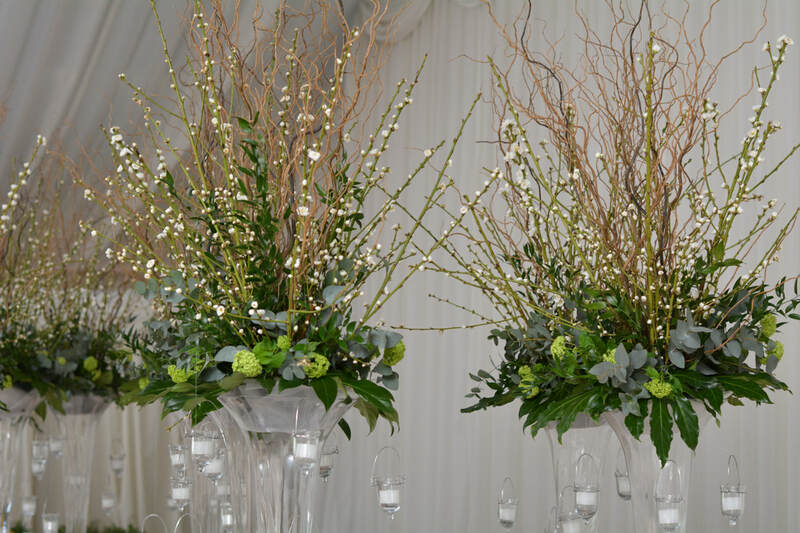 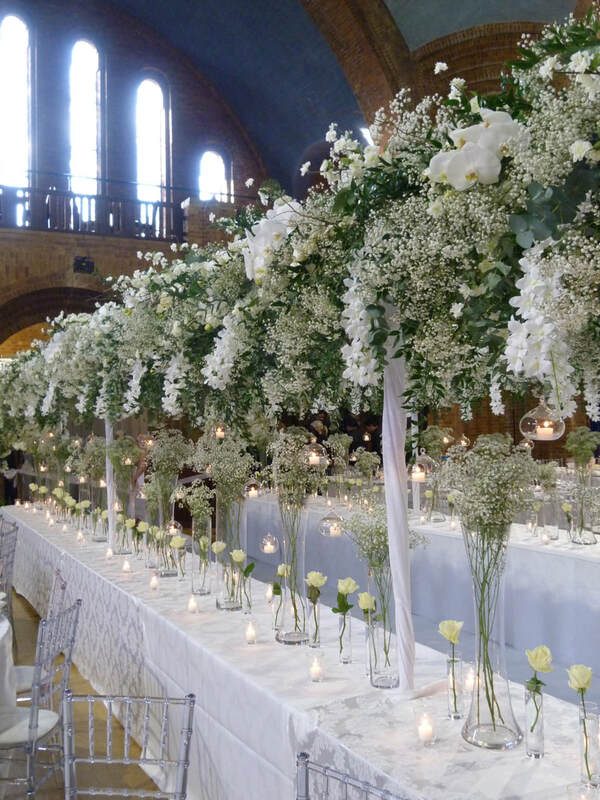 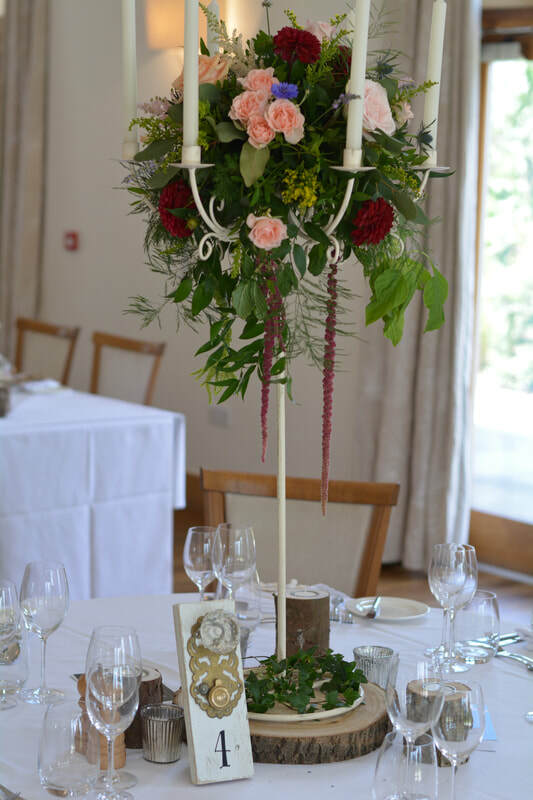 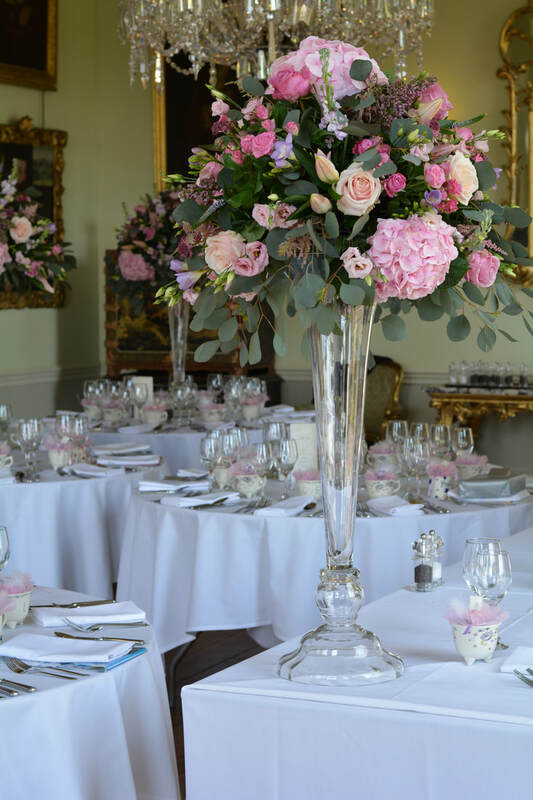 We used our glass cylinder vases with floating flower and candle on log slices for the simple centrepieces along with our show stopper tall vases with a fabulous rainforest inspired floral arranmengt by Julia Dilworth of Julias Flowers to add drama. 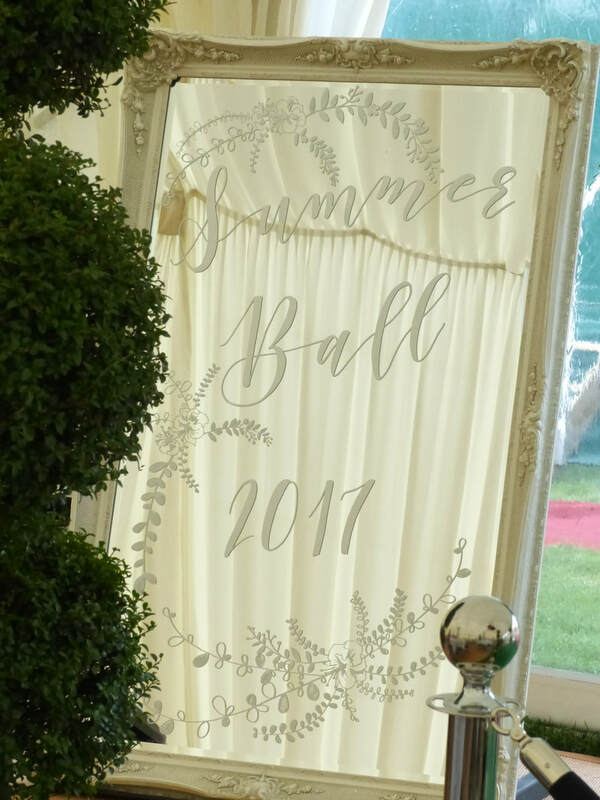 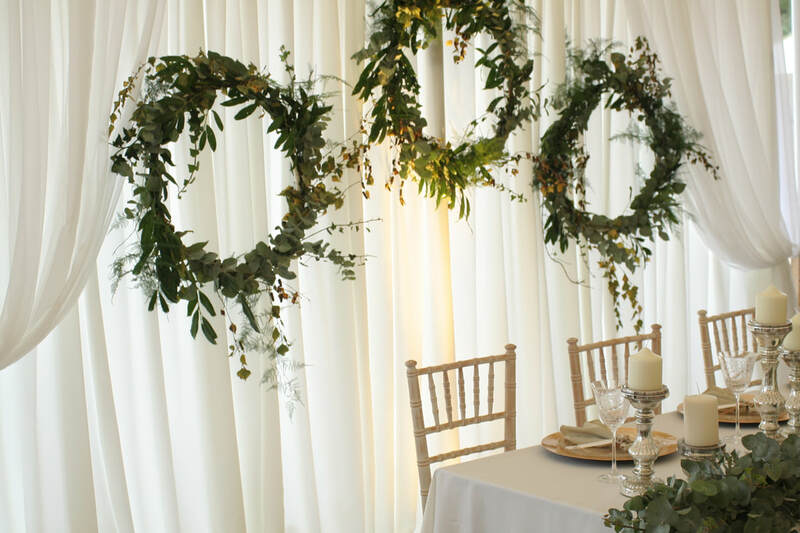 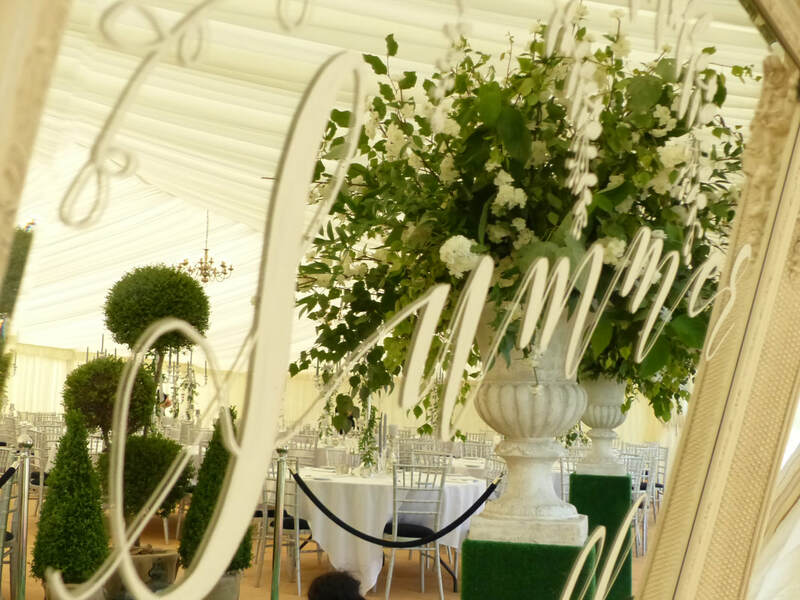 For their backdrop we hung a simple drape either side of a large rustic wooden plank board on which we handprinted their monogram using a curtain of ruscus across the top of the drapes to tie the look together. 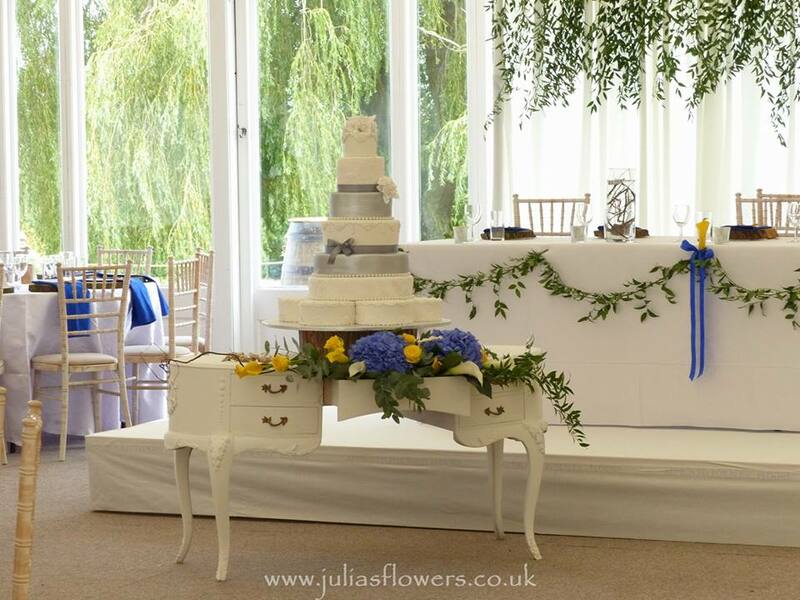 The cake table looked amazing with a fabulous floral arrangement by Julia to support a very large seven tiered cake! 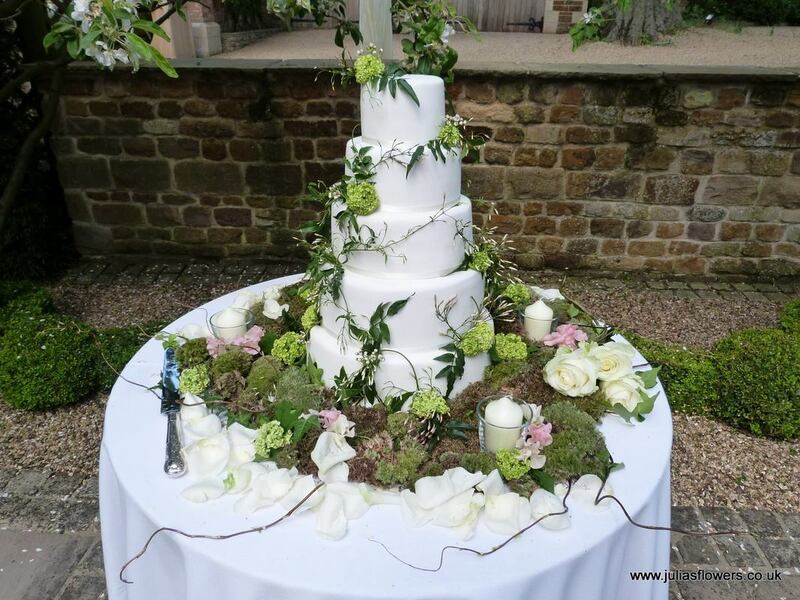 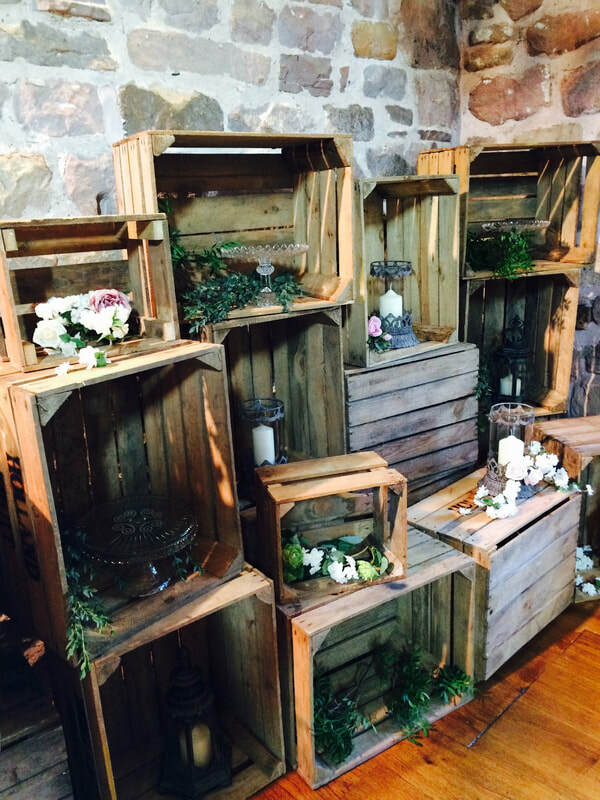 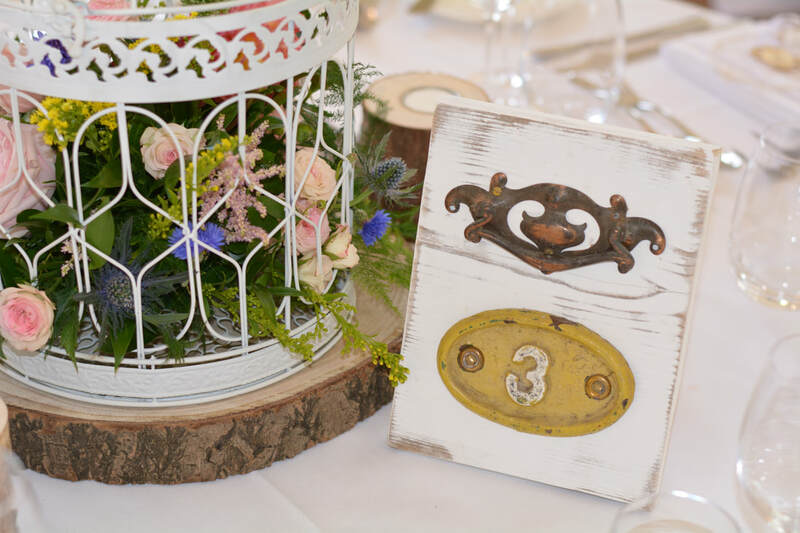 and some lovely summery rustic weddings from Hothorpe Hall & The Woodlands. 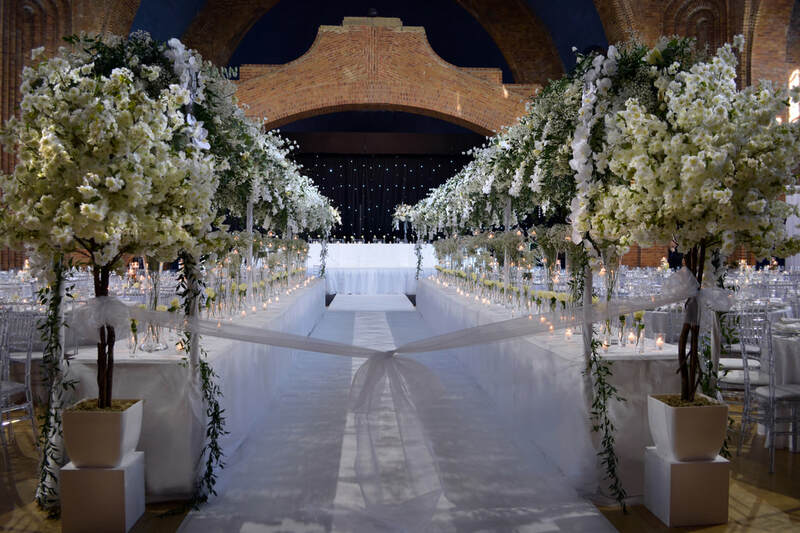 We love love love this venue! 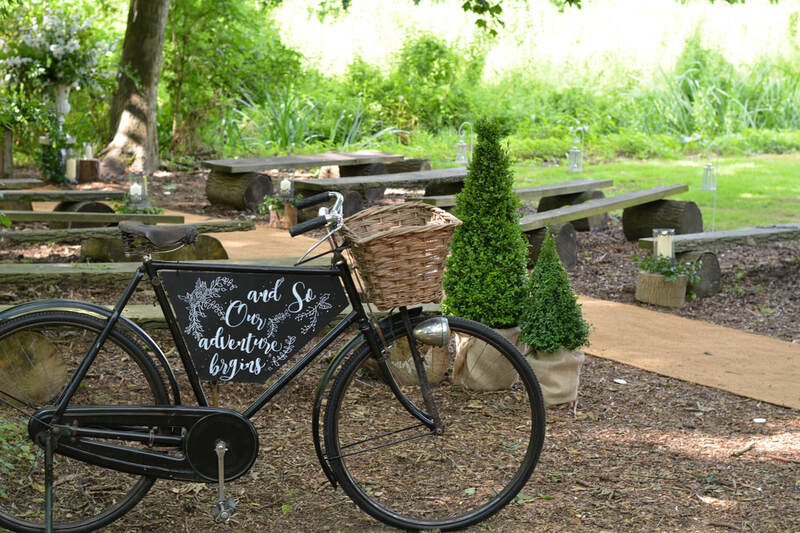 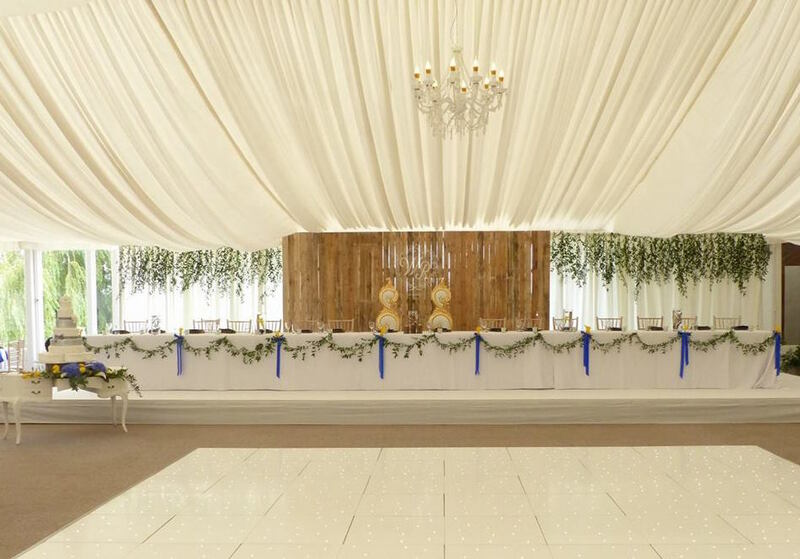 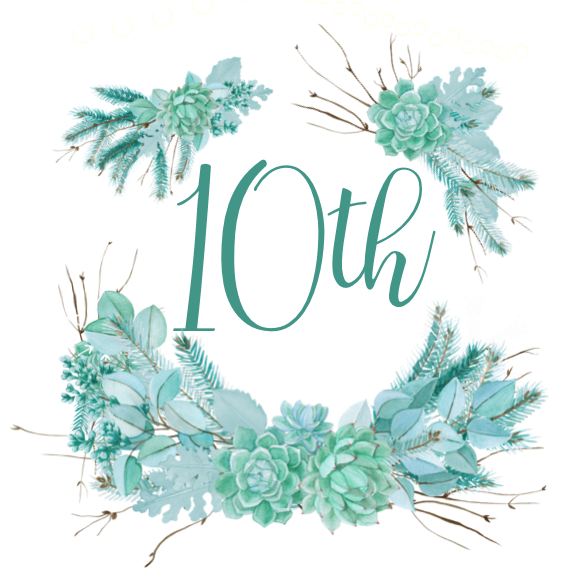 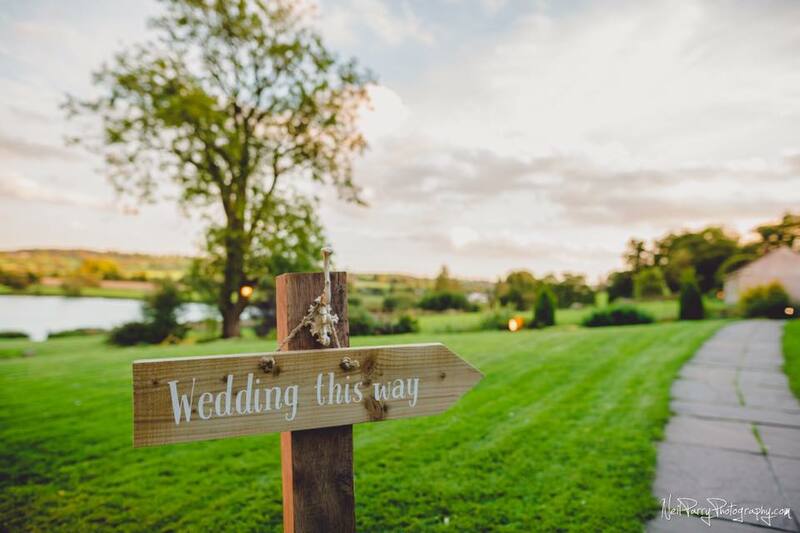 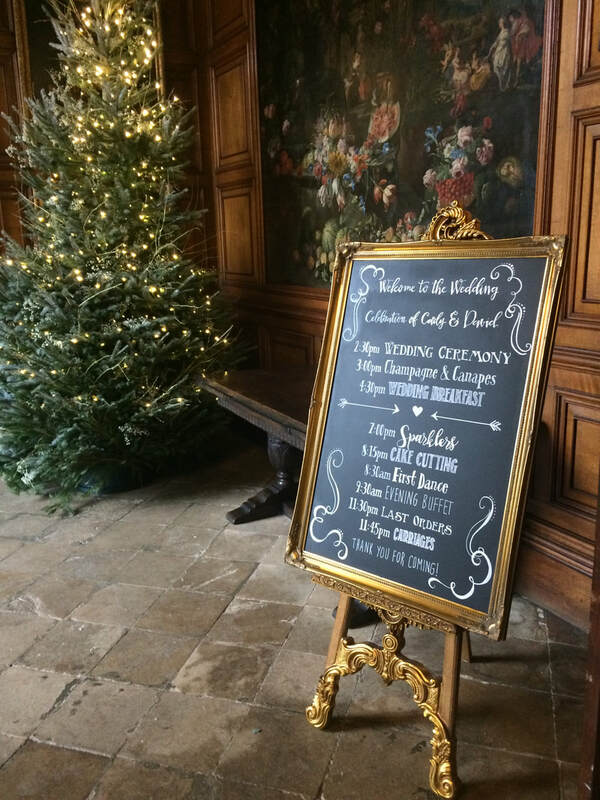 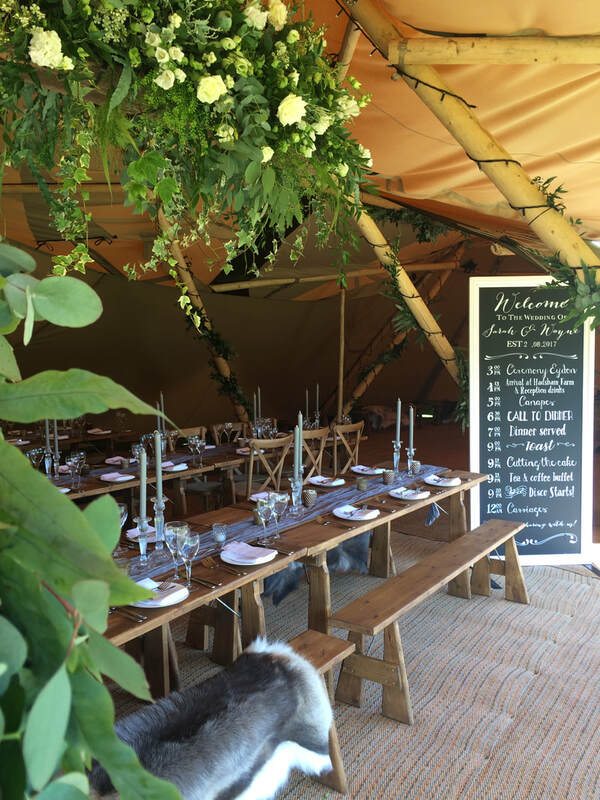 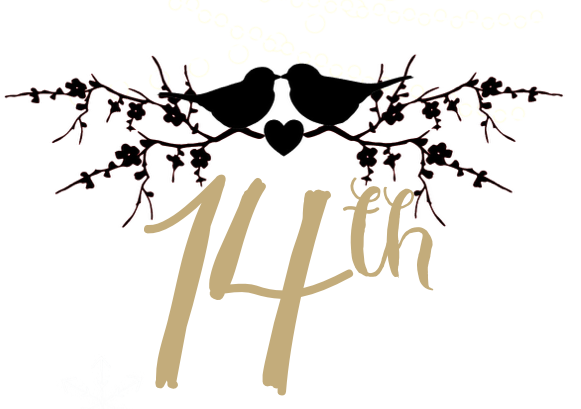 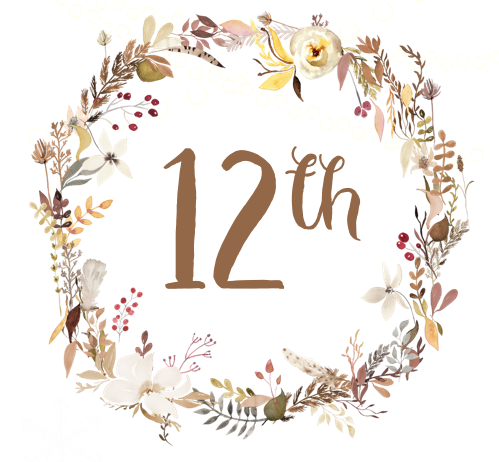 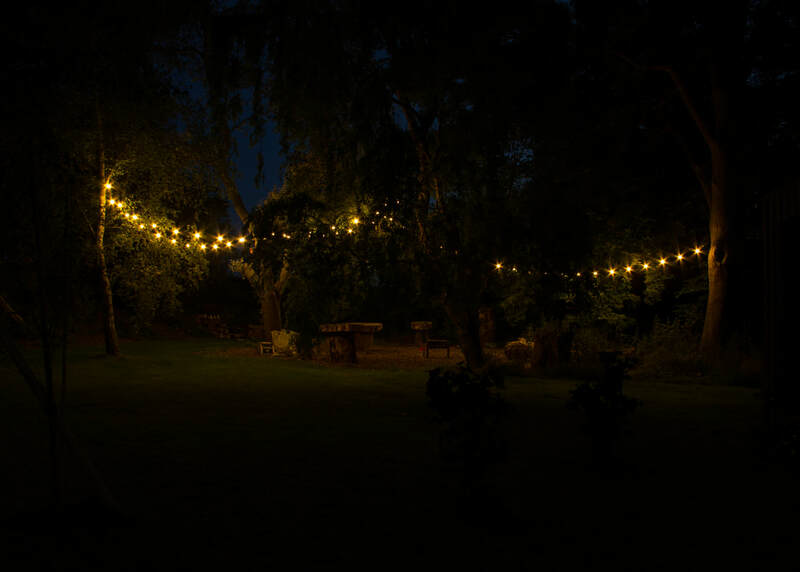 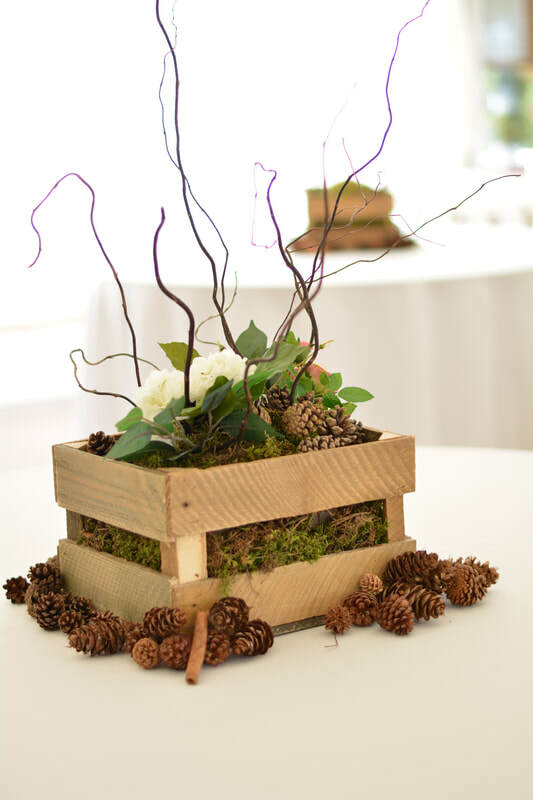 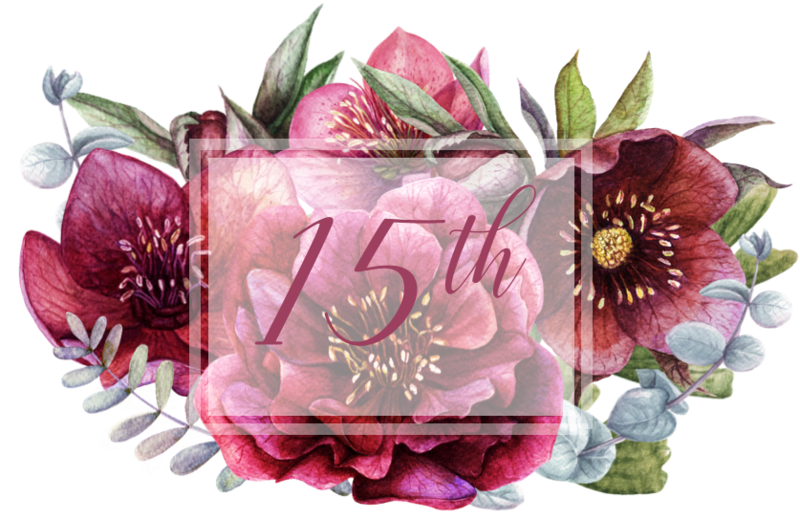 Not only is it very close to us, it is a totally unique venue with everything you need for the perfect Pinterest worthy woodland wedding with the added bonus of fabulous indoor spaces in case the weather is challenging you. 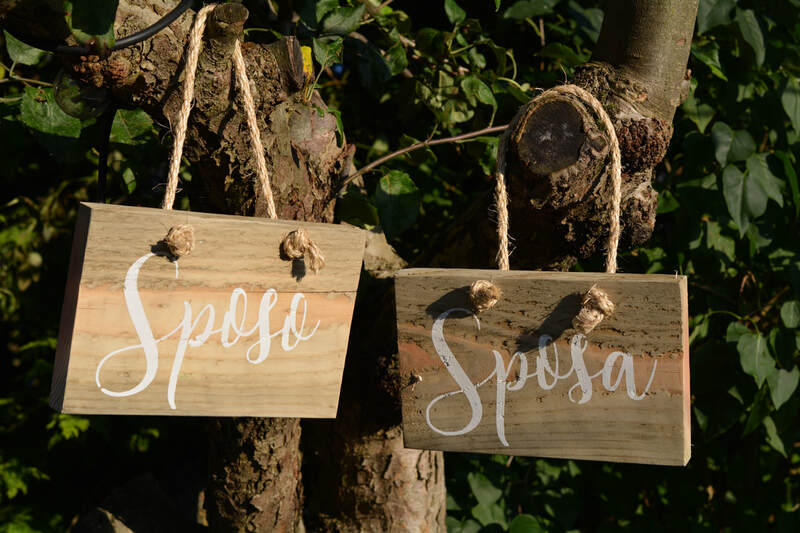 With lovely wooden cabins for your guests and a plush grown up tree house for the honeymoon suite, you must put The Woodlands on your list of venues to visit! 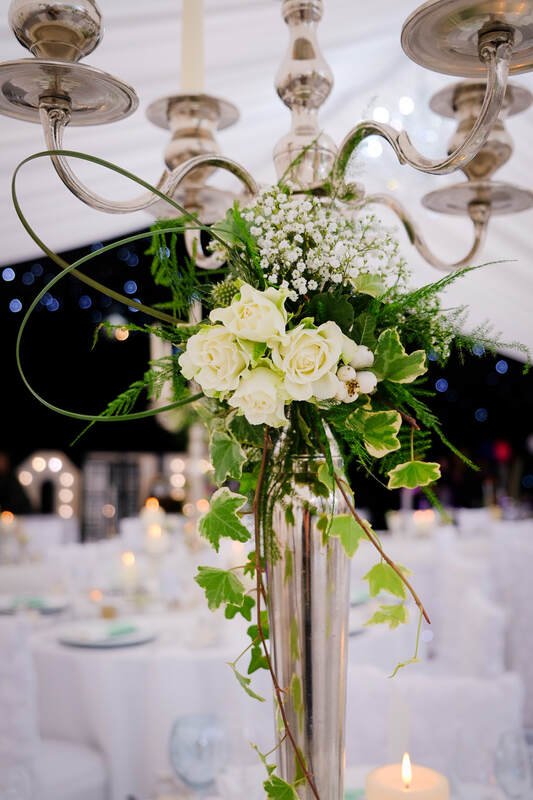 Below are some of our favourite pictures form The Woodlands weddings. 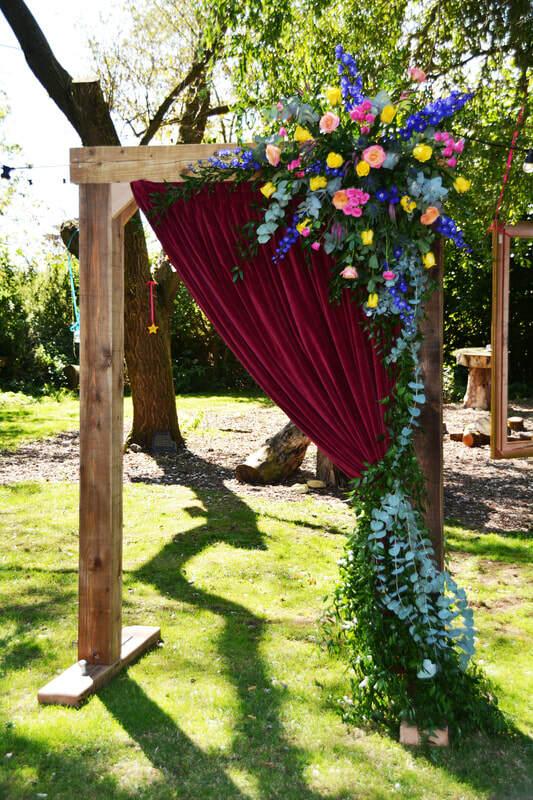 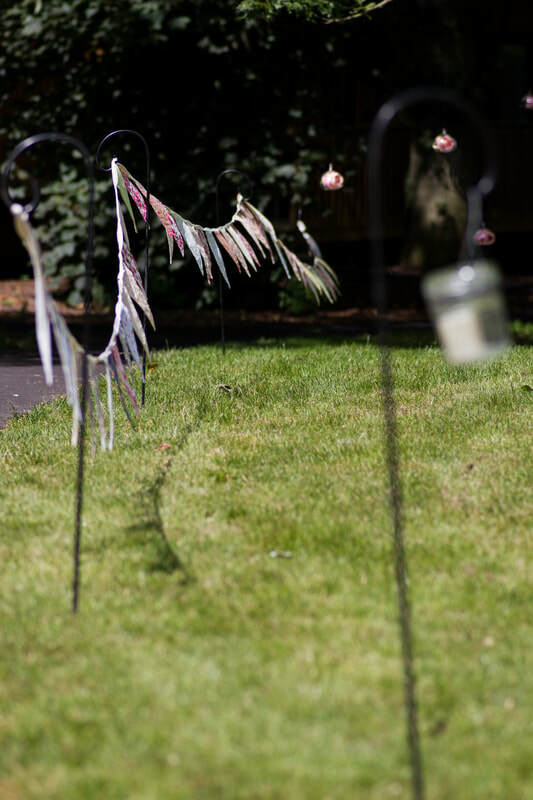 Worth a mention, the outdoor blessing area is enjoying a total make over and is now licensed for civil ceremonies. 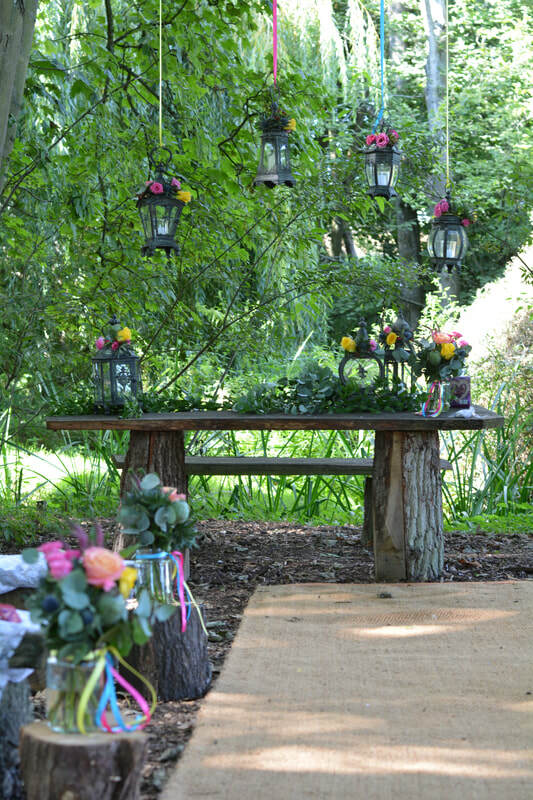 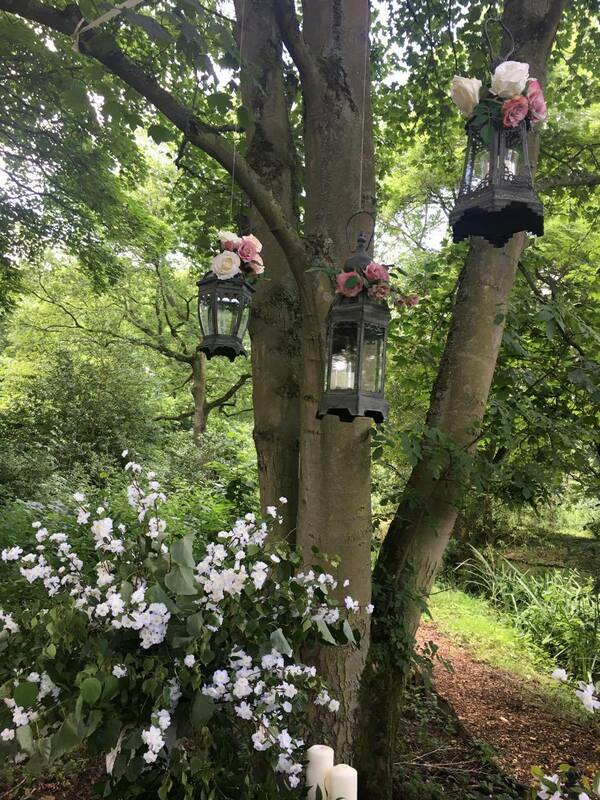 2018 brides will be able to enjoy a Twilight Woodland wedding for real and we simply cannot wait! 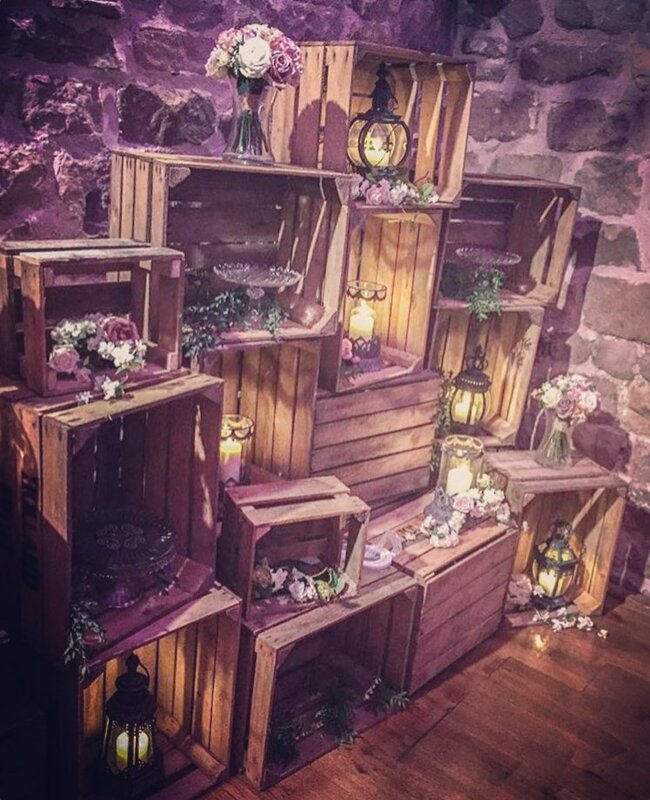 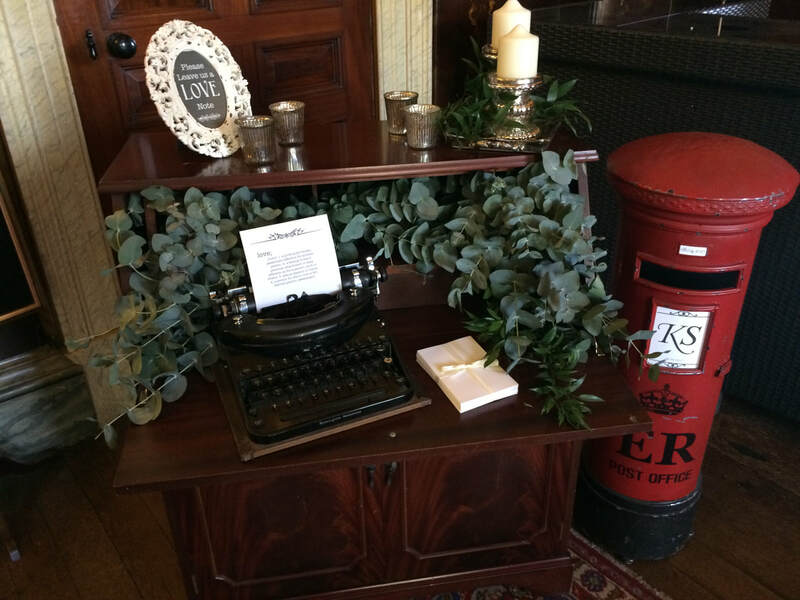 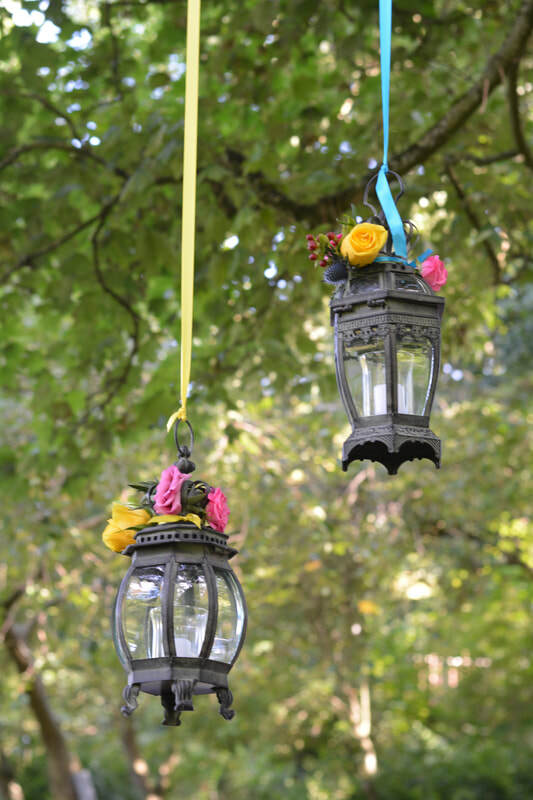 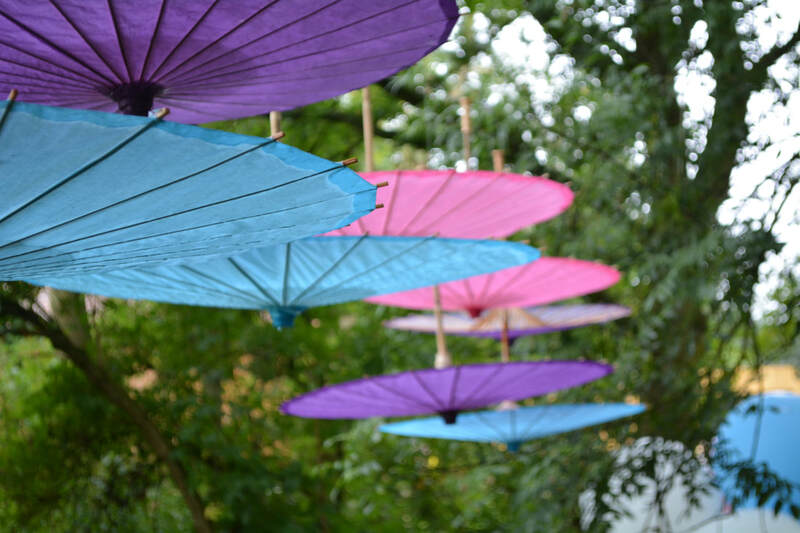 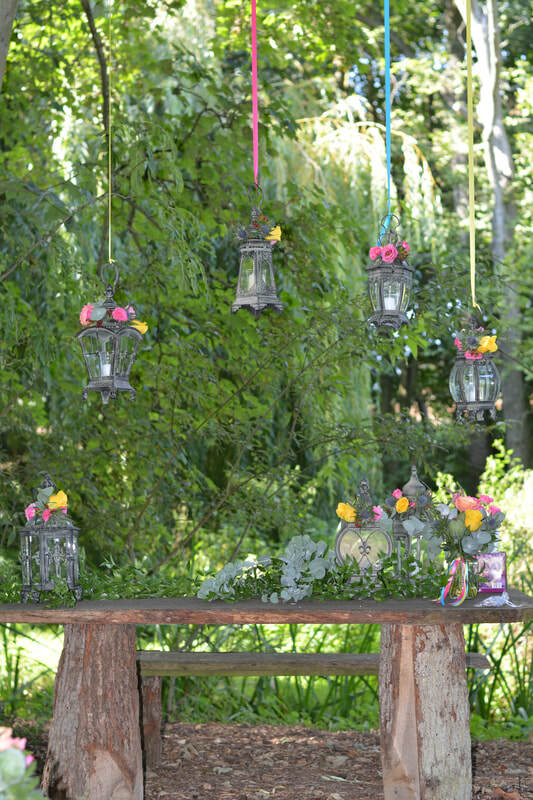 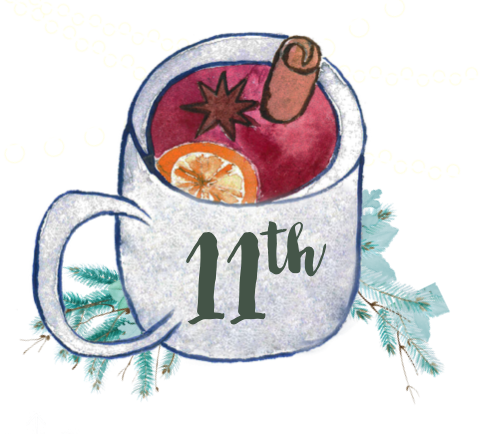 If you liked any of the styling and props featured in this blog get in touch for a chat. 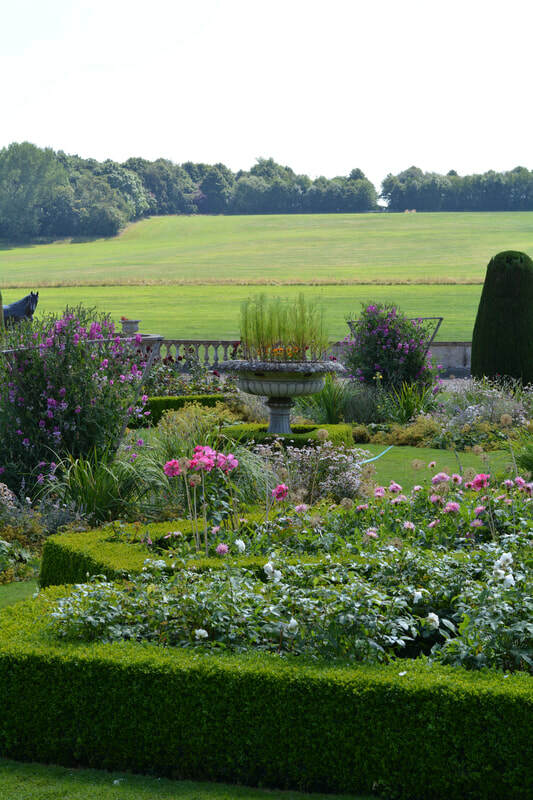 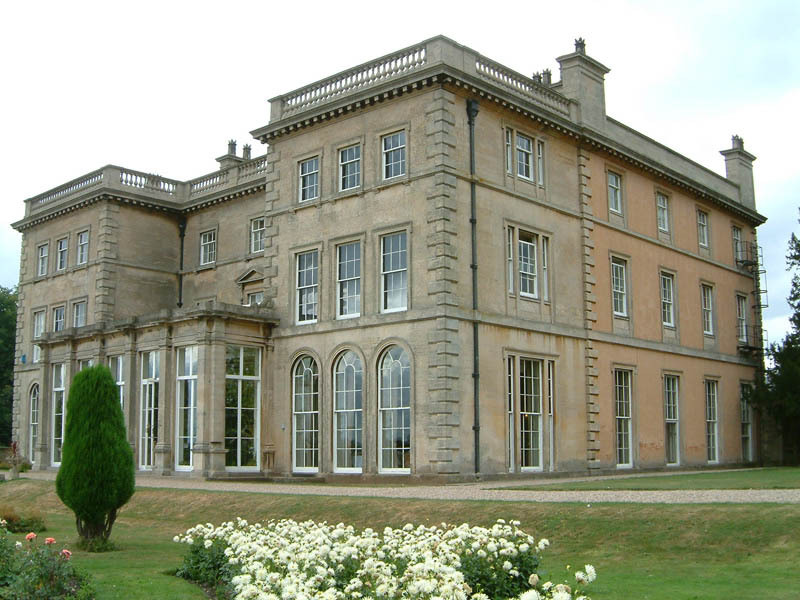 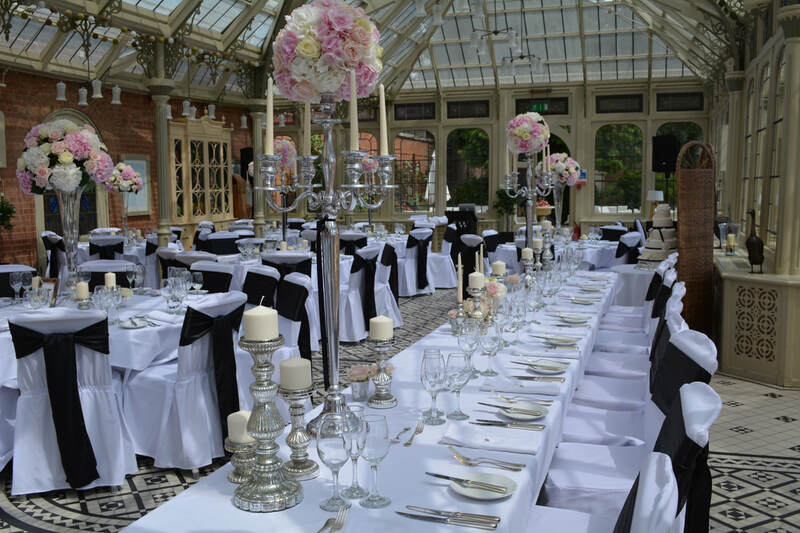 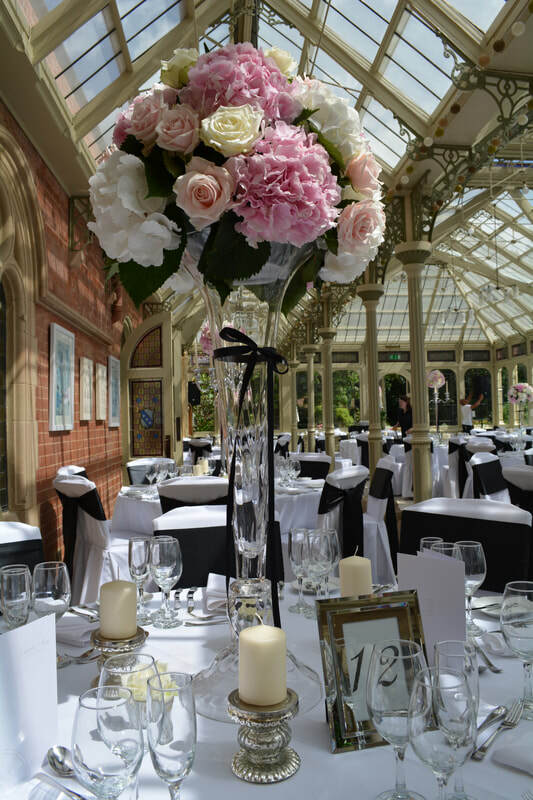 To visit this venue contact Hothorpe Hall & The Woodlands on 01858 881500. 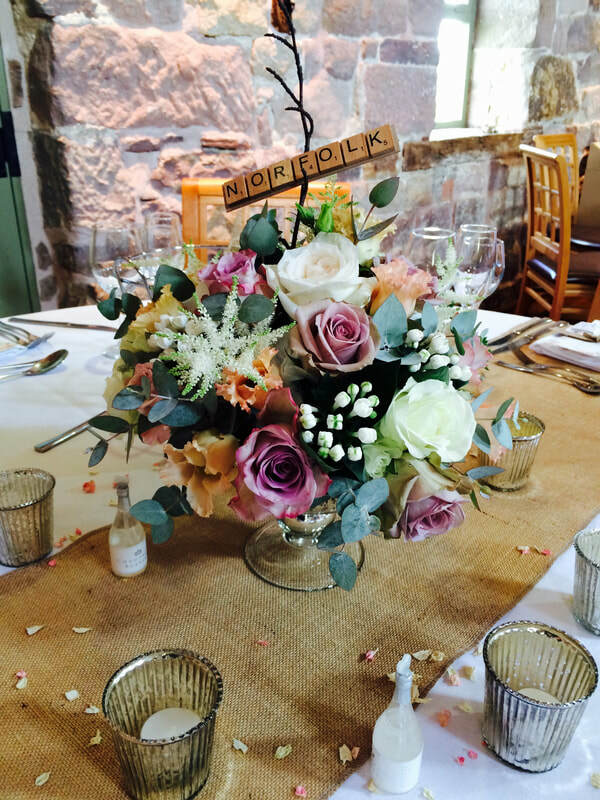 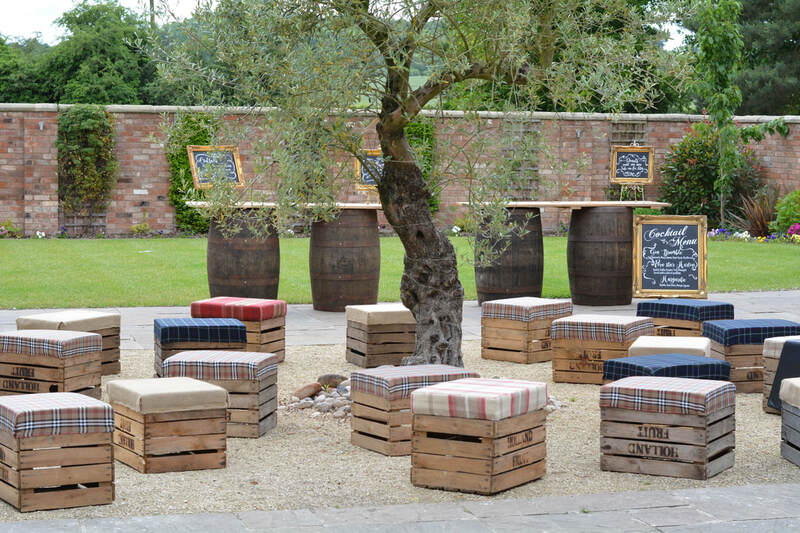 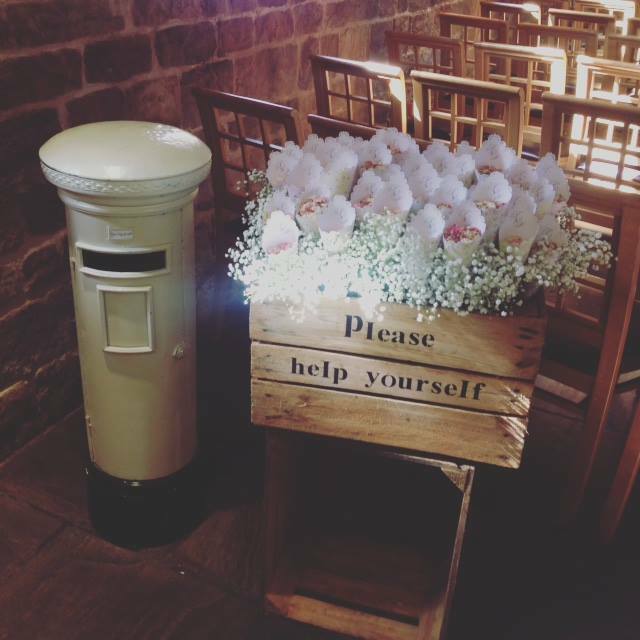 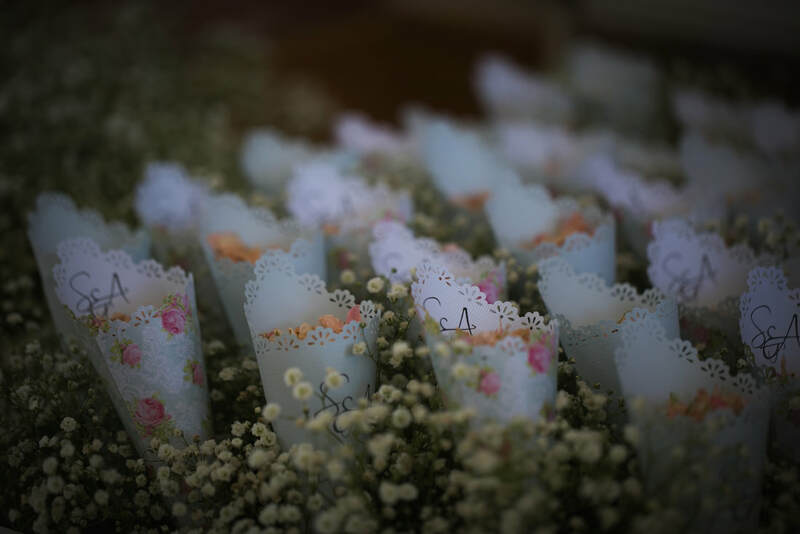 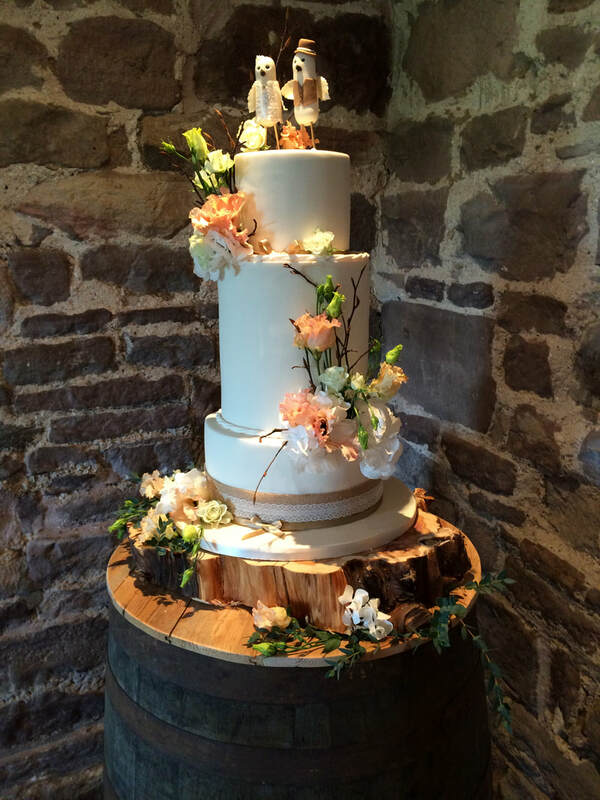 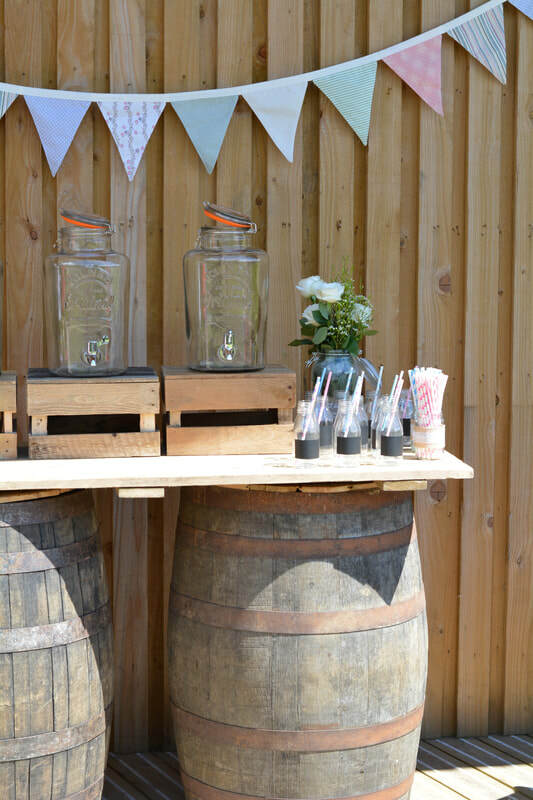 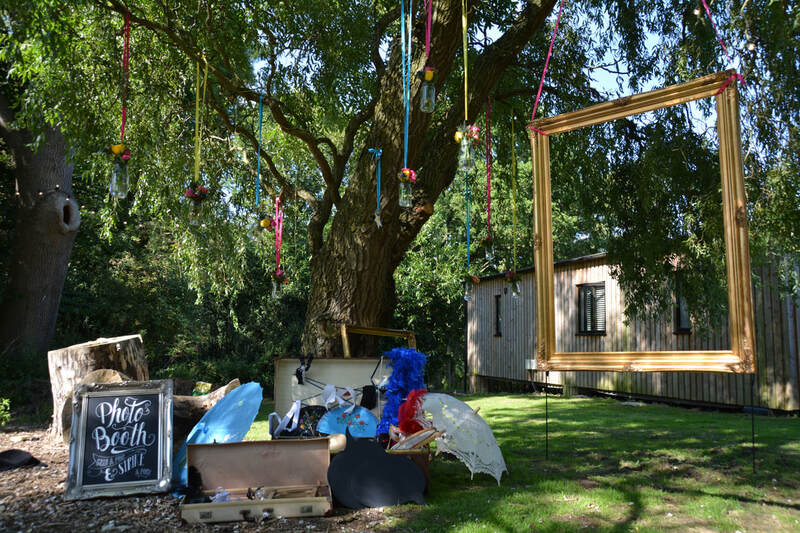 Todays share was a lovely wedding at Mythe Barn in July. 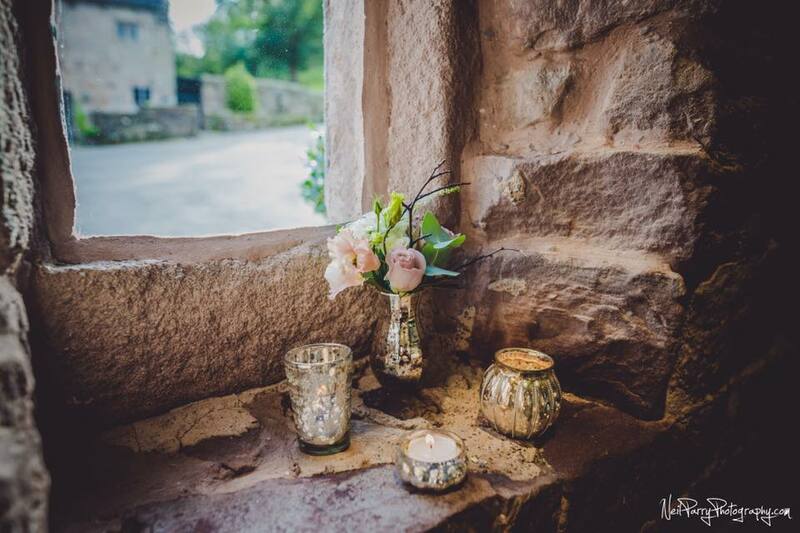 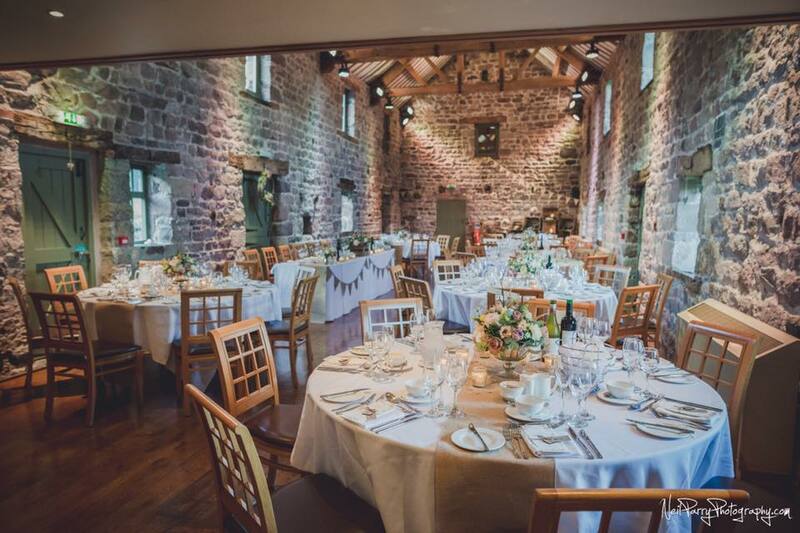 If you are looking for a Barn style wedding Mythe Barn should really be on your list of venues to visit. 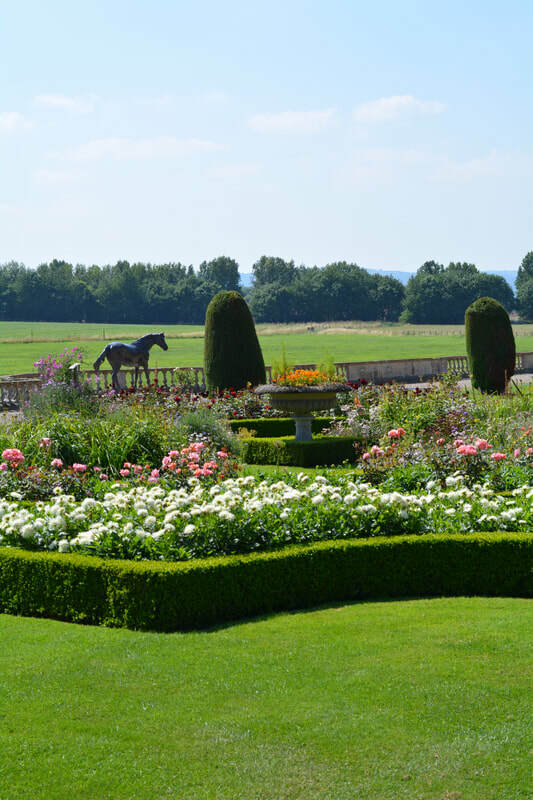 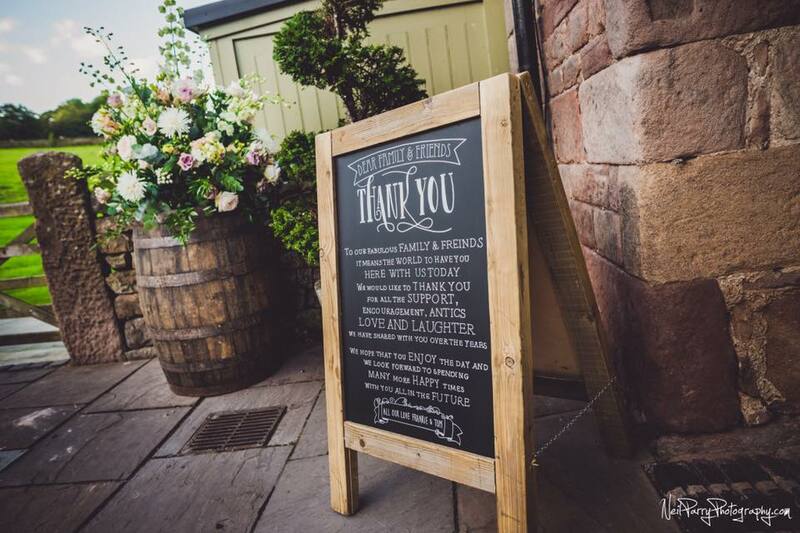 The approach to the barn is beautiful and the barn itself has been renovated to an extremely high standard. 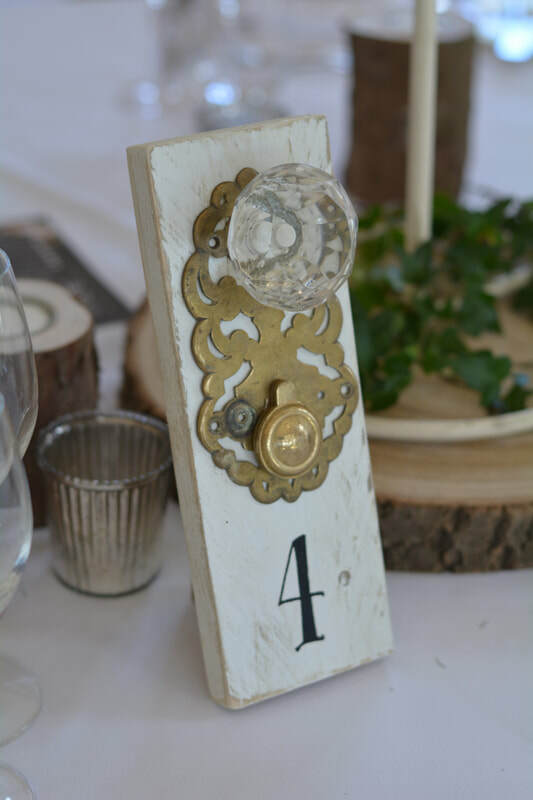 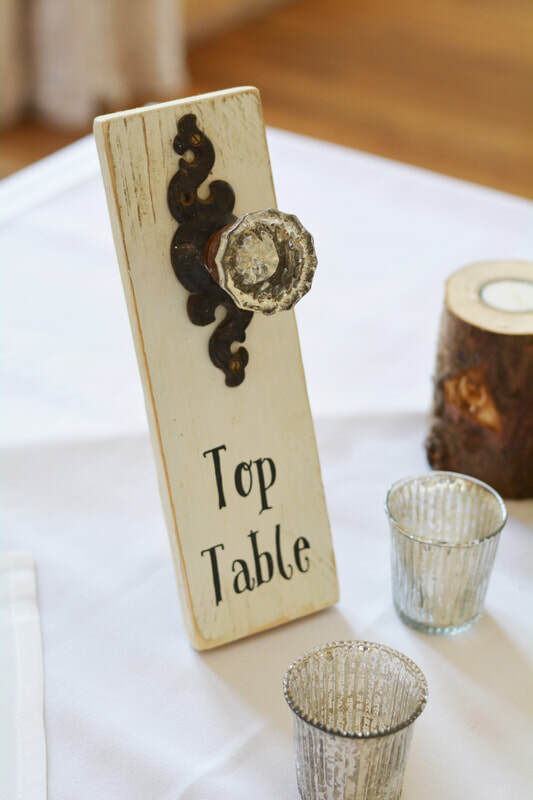 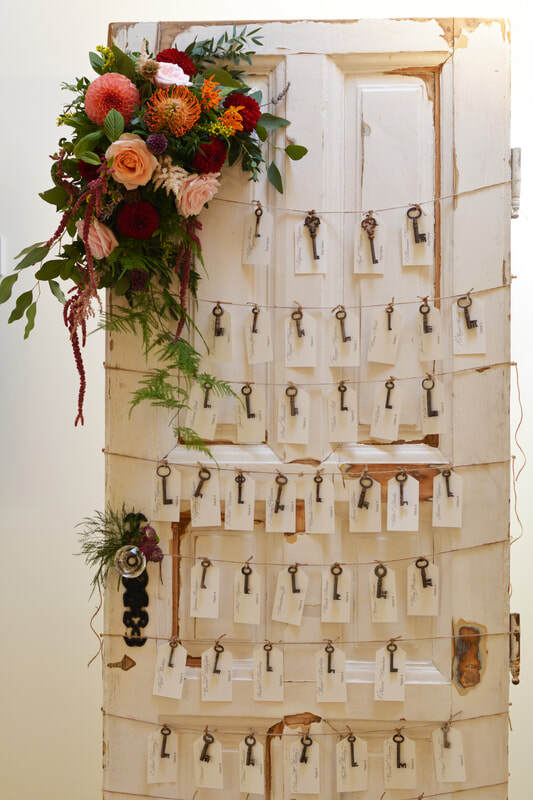 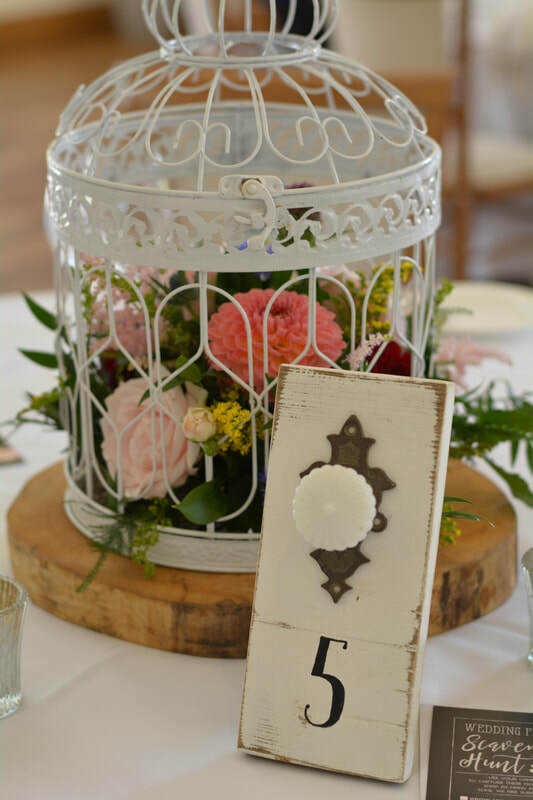 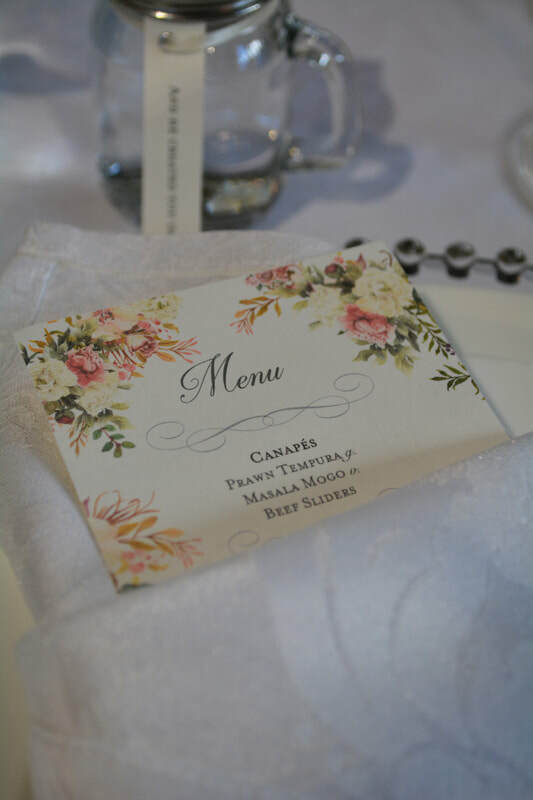 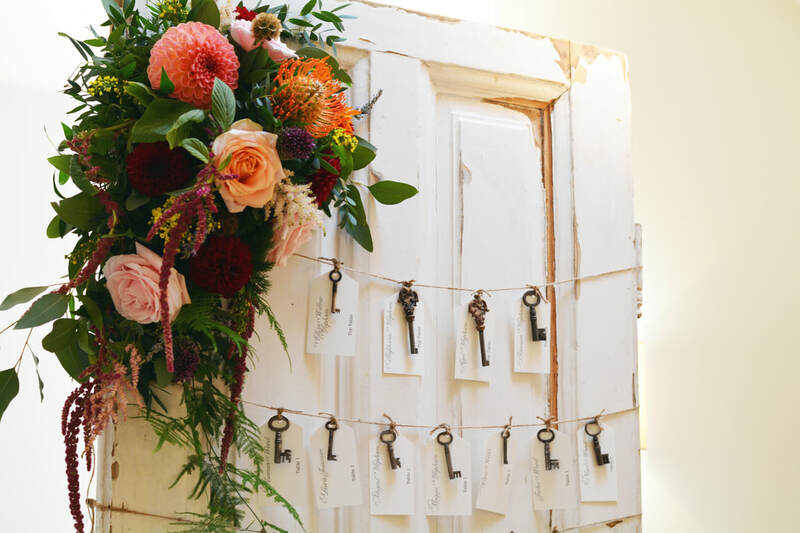 For this wedding we used our rustic door table plan with matching vintage door knob table numbers. 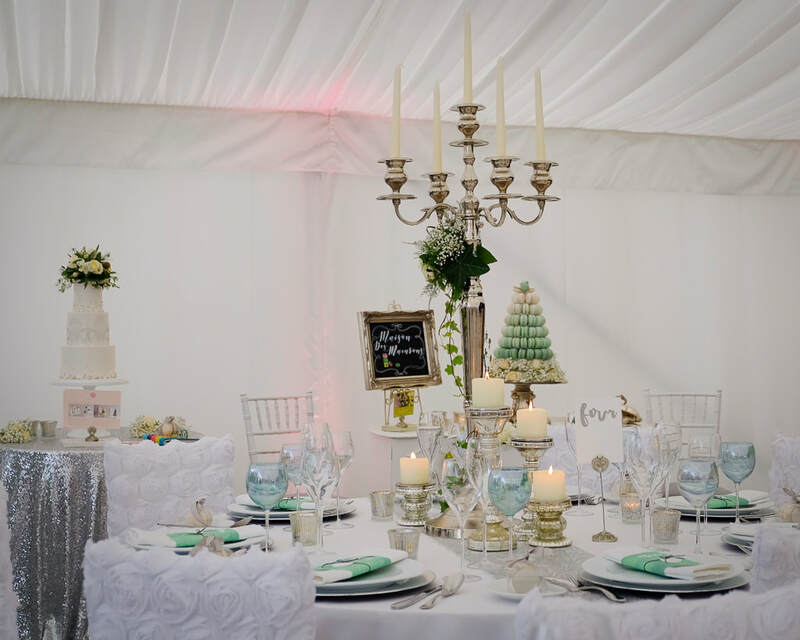 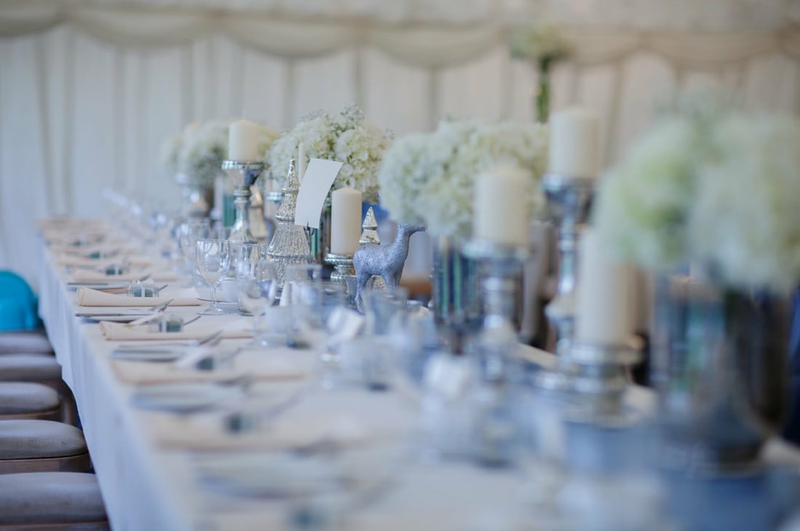 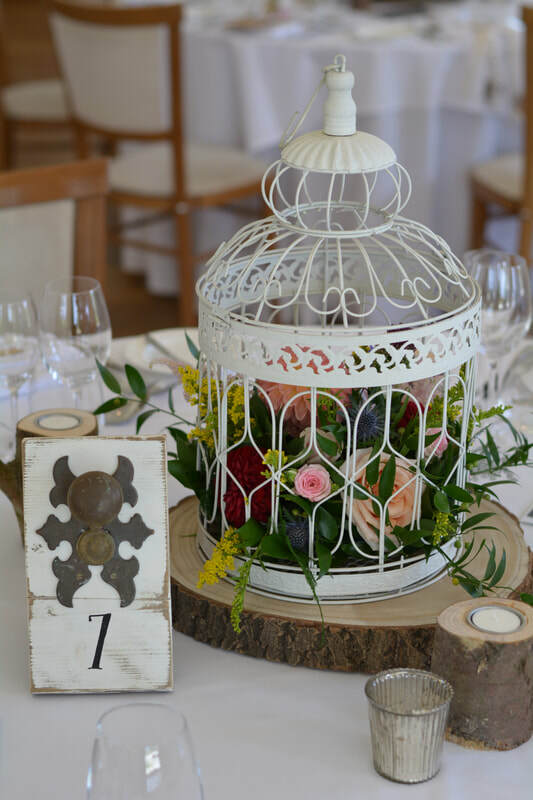 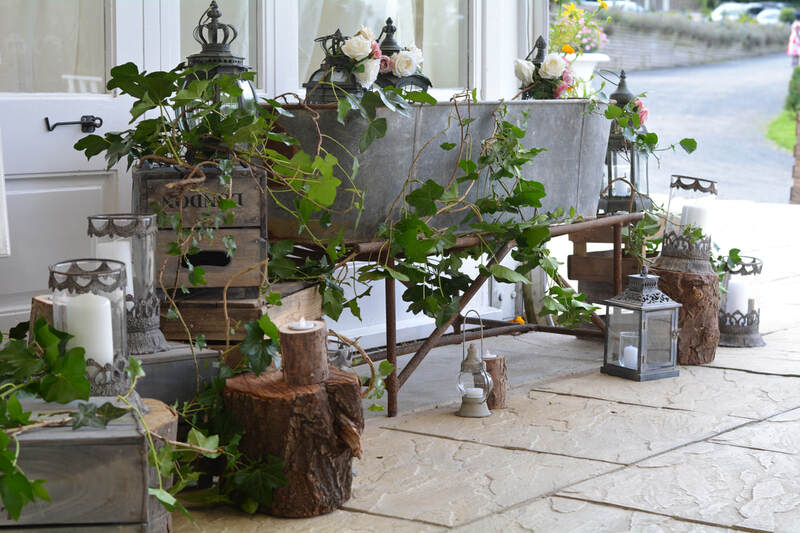 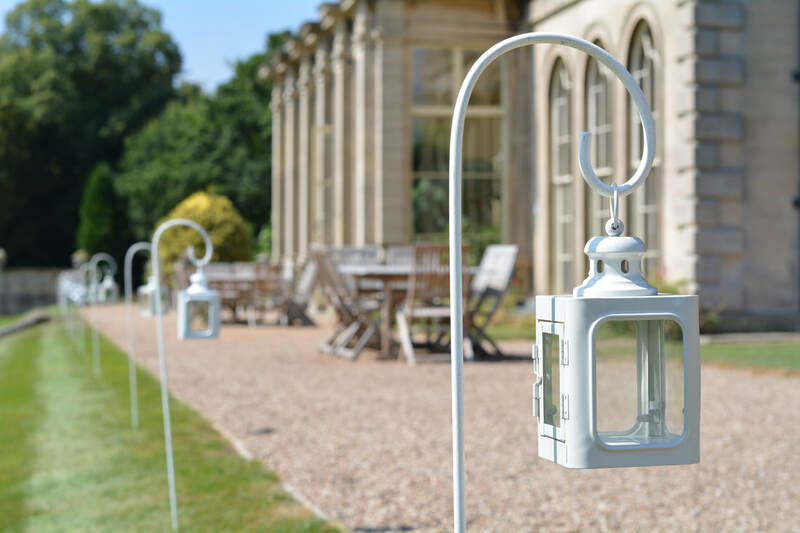 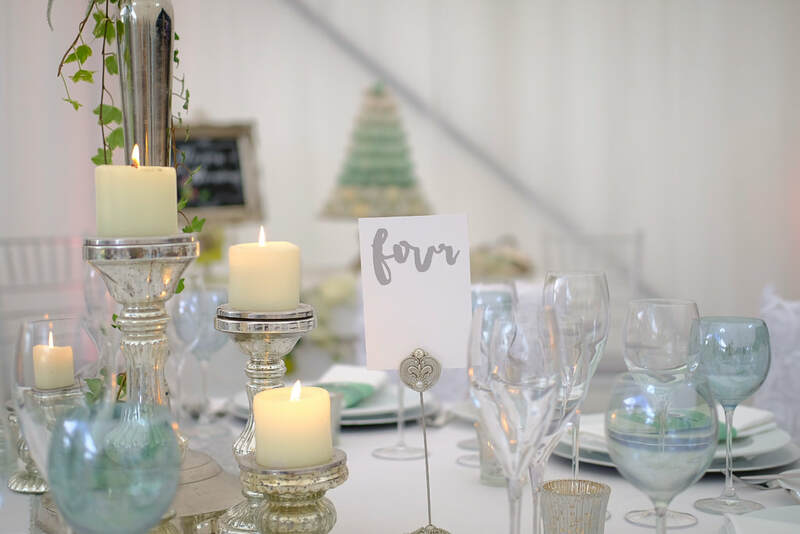 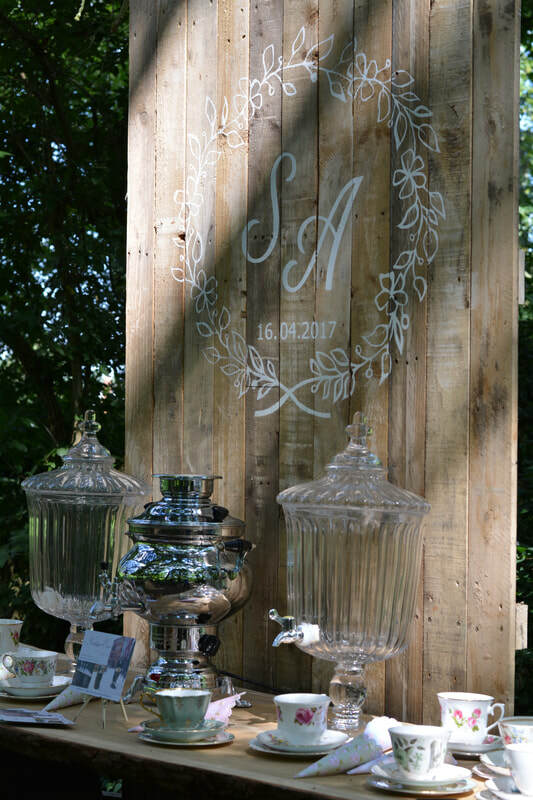 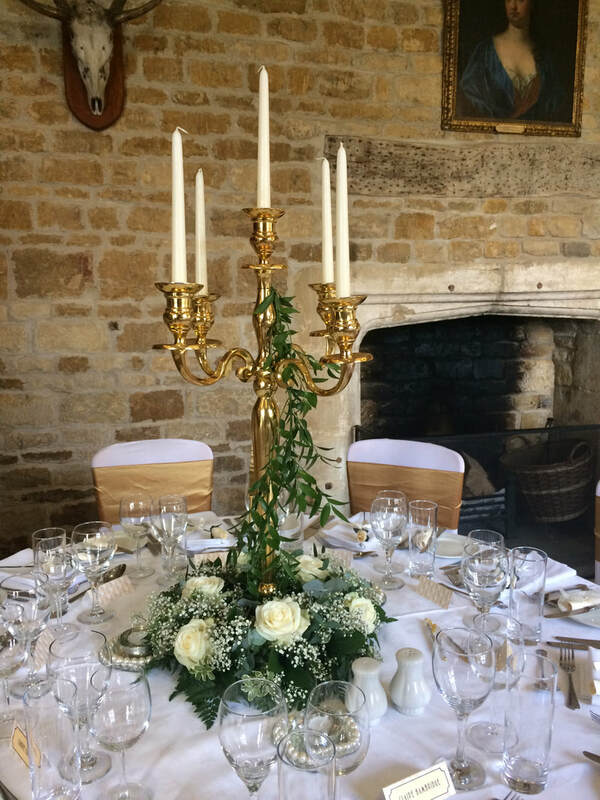 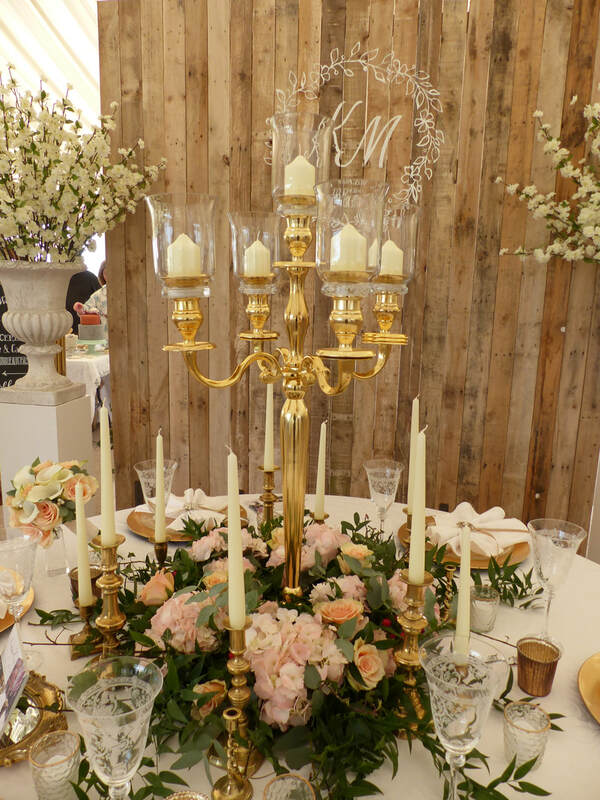 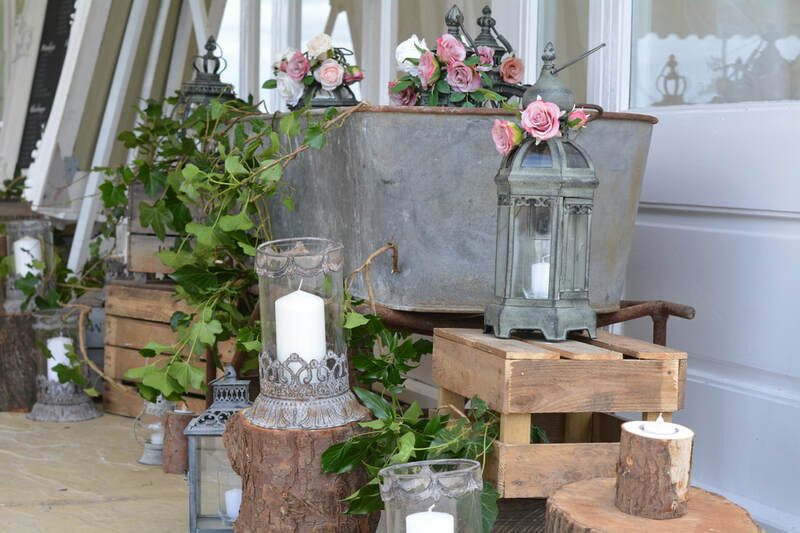 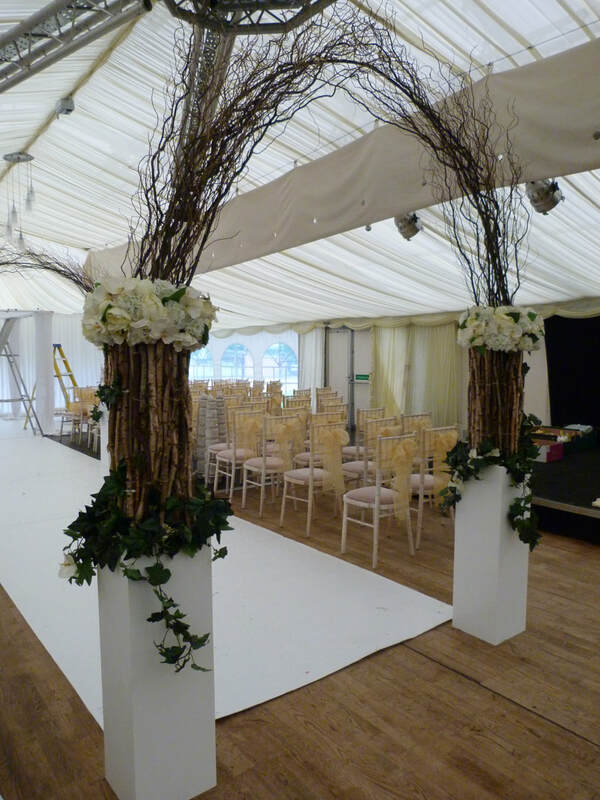 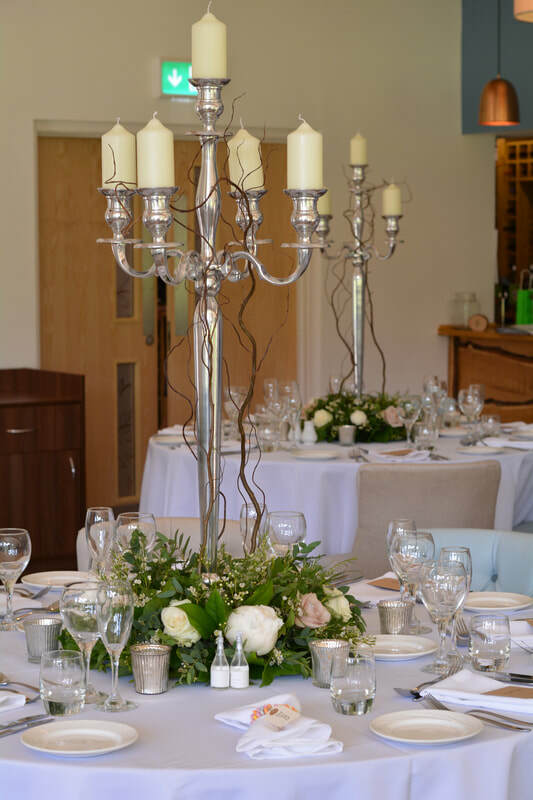 They also hired our ivory 6 arm candleabras and birdcages, log slice centres and ridged mercury votives with tree stump tealight holders to complete the look. 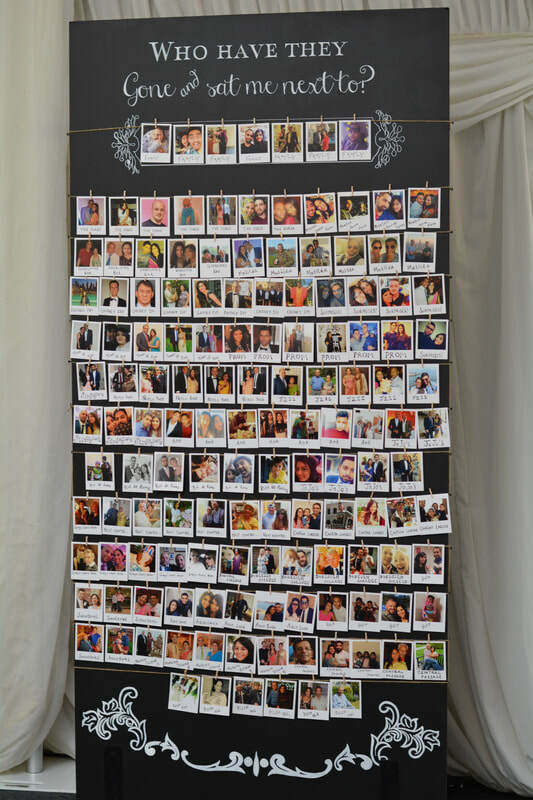 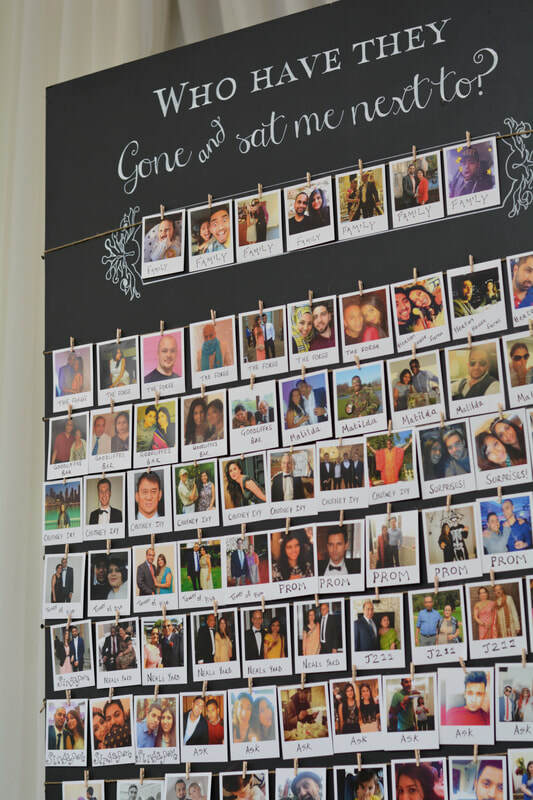 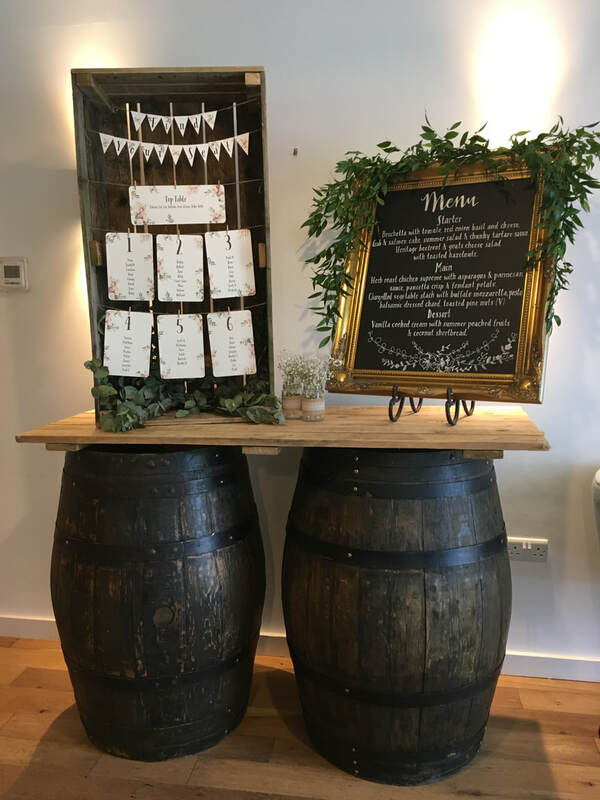 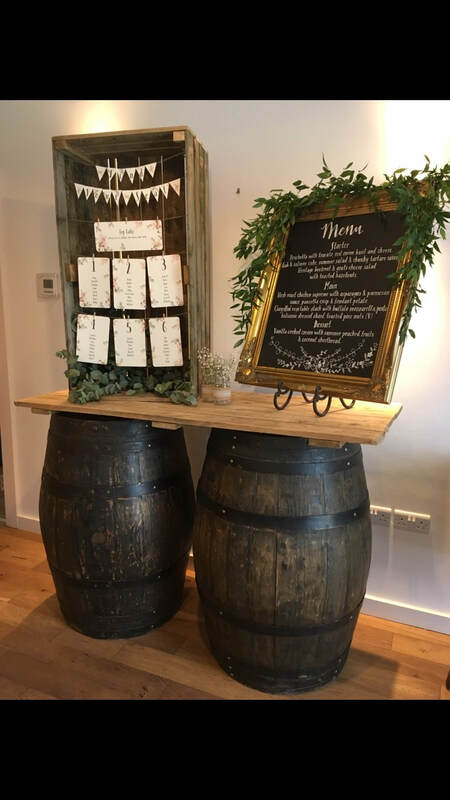 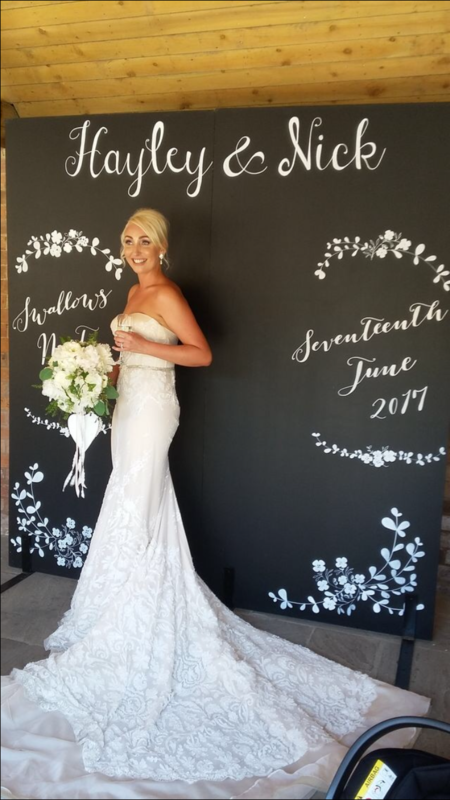 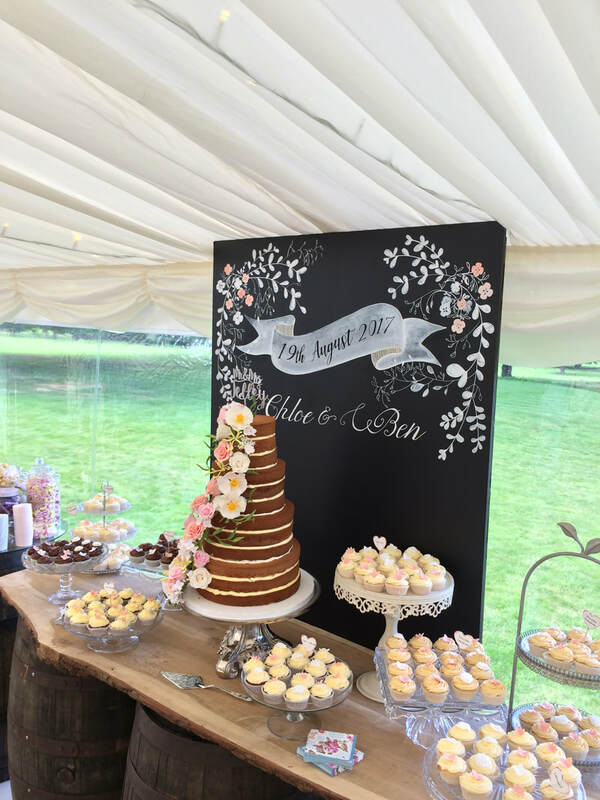 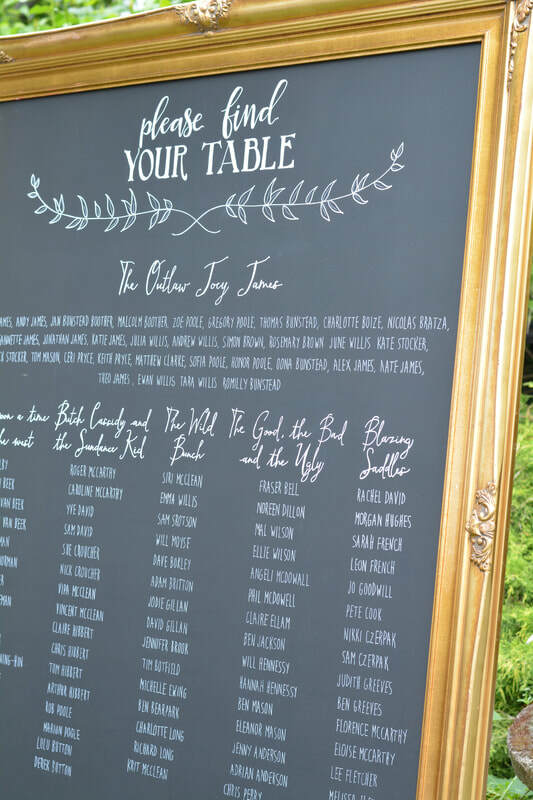 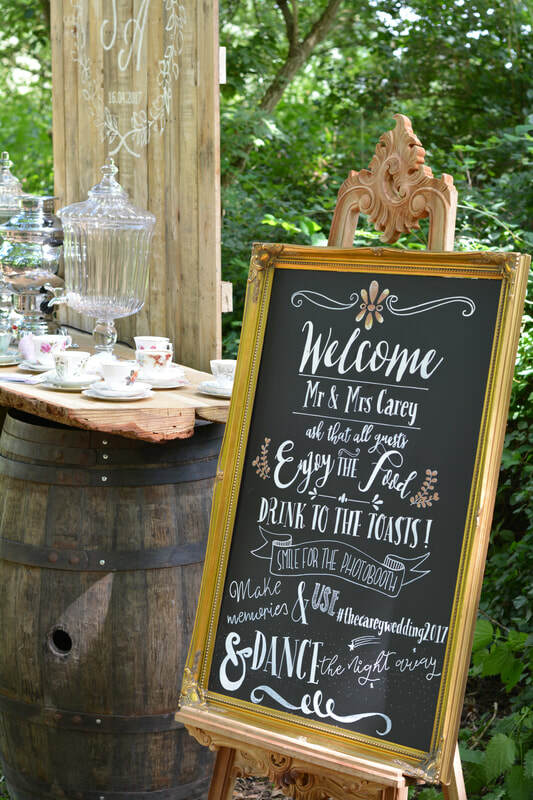 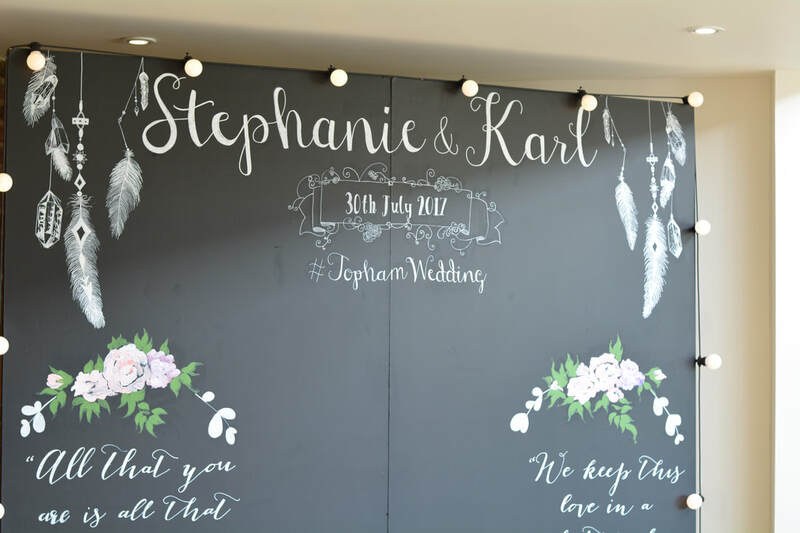 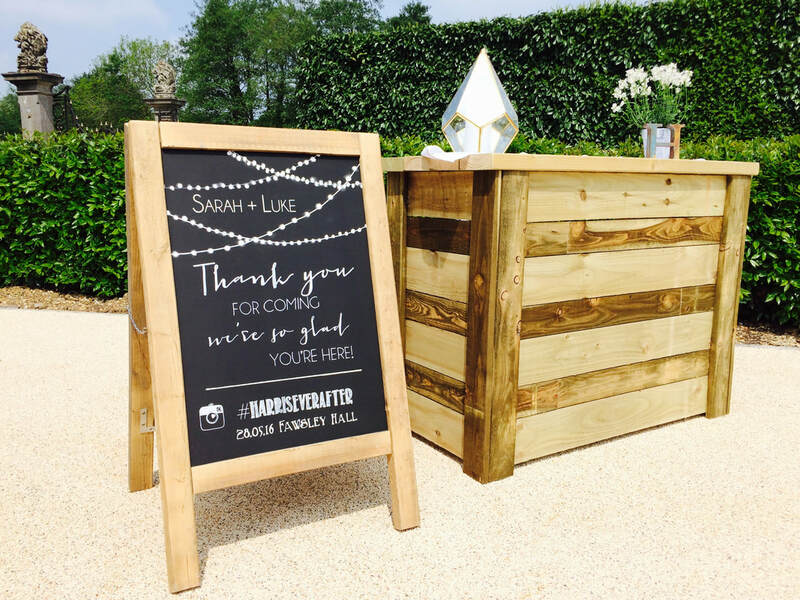 In the bar area we installed our giant chalk board backdrop personalised with the bride and grooms messages and large travel trunk filled with props for an alternative photo booth. 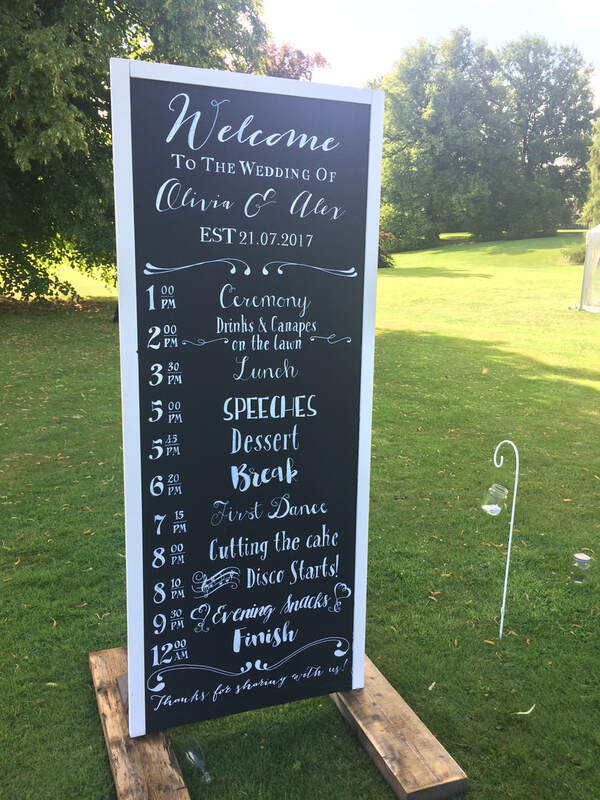 We added some hand painted flowers to the chalk board, something I love to do and works particularly well on the mirror signage too. 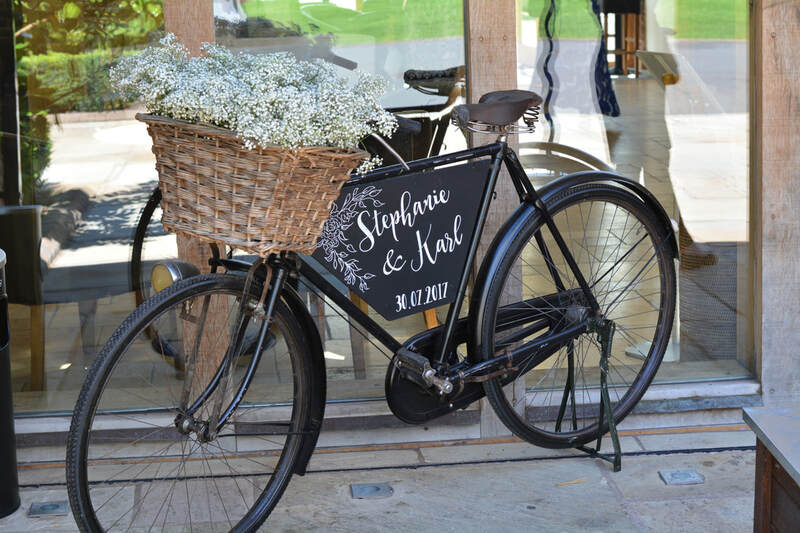 Outside our vintage bike welcomed their guests. 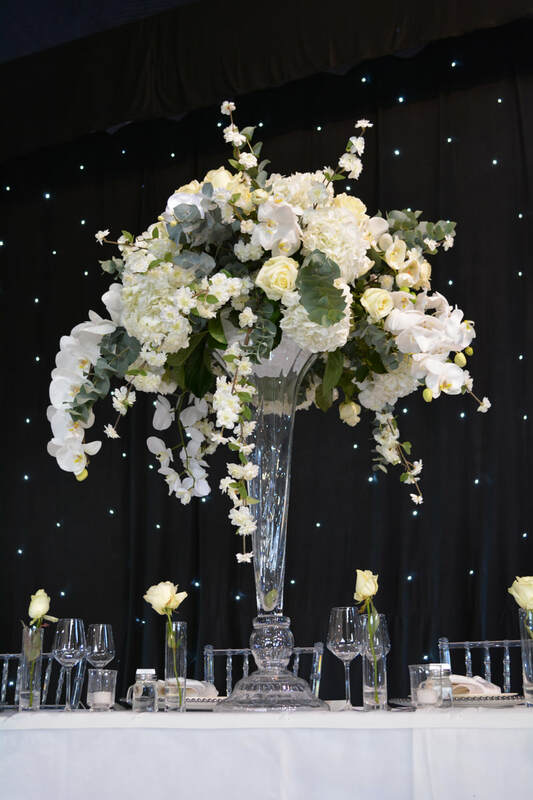 The beautiful floral arrangements were by Jessica Mary Flowers. 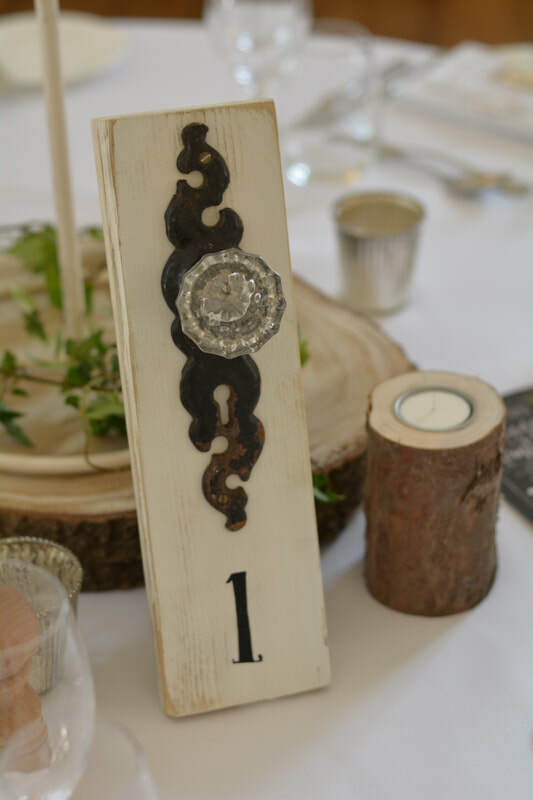 For more information about the items listed click on the links or get in touch for a chat.